Electrical Discharge Machining (EDM). Introduction. 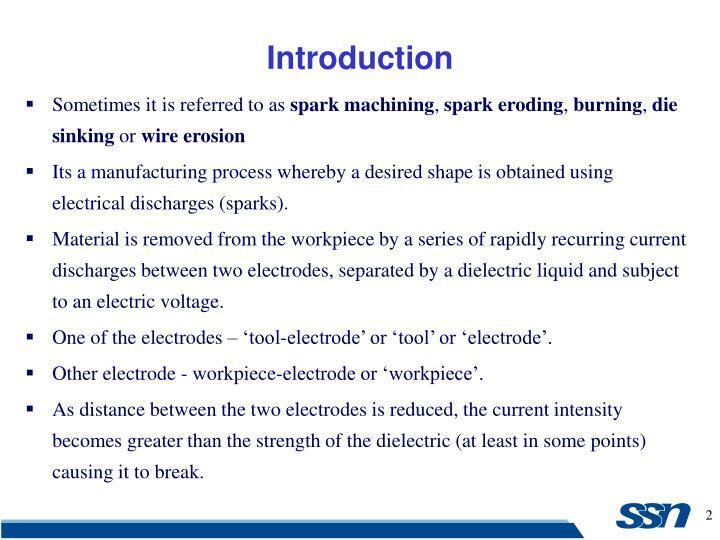 Sometimes it is referred to as spark machining , spark eroding , burning , die sinking or wire erosion Its a manufacturing process whereby a desired shape is obtained using electrical discharges (sparks). Its a manufacturing process whereby a desired shape is obtained using electrical discharges (sparks). 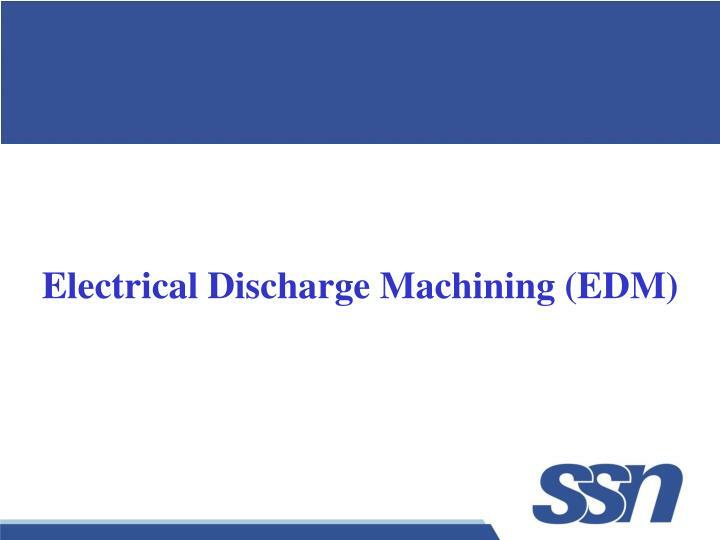 Material is removed from the workpiece by a series of rapidly recurring current discharges between two electrodes, separated by a dielectric liquid and subject to an electric voltage. One of the electrodes – ‘tool-electrode’ or ‘tool’ or ‘electrode’. Other electrode - workpiece-electrode or ‘workpiece’. As distance between the two electrodes is reduced, the current intensity becomes greater than the strength of the dielectric (at least in some points) causing it to break. This allows current to flow between the two electrodes. This phenomenon is the same as the breakdown of a capacitor. As a result, material is removed from both the electrodes. Once the current flow stops, new liquid dielectric is usually conveyed into the electrode zone enabling the solid particles (debris) to be carried away. 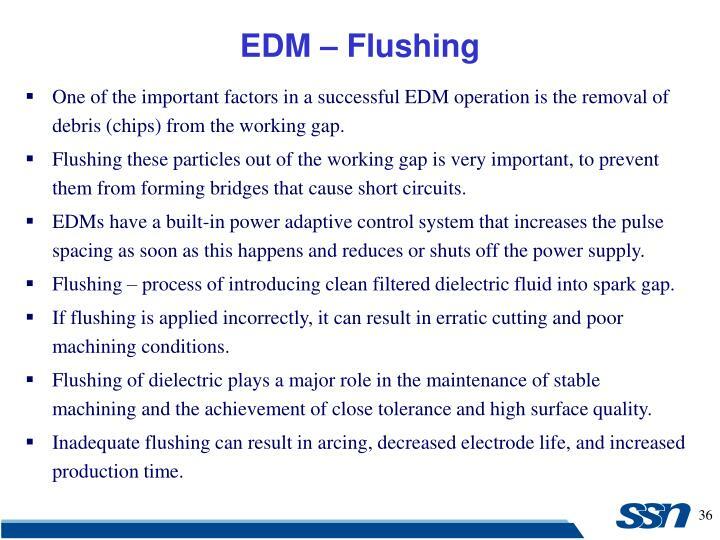 Adding new liquid dielectric in the electrode volume is commonly referred to as flushing. 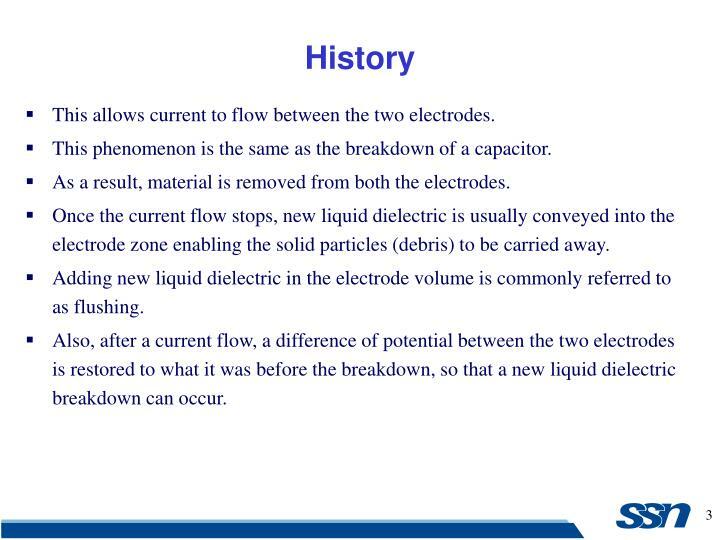 Also, after a current flow, a difference of potential between the two electrodes is restored to what it was before the breakdown, so that a new liquid dielectric breakdown can occur. In 1770, English Physicist Joseph Priestley studied the erosive effect of electrical discharges. 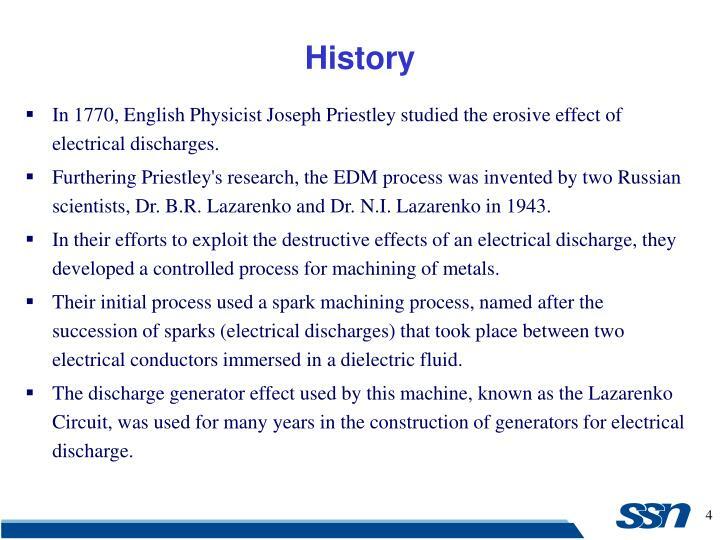 Furthering Priestley's research, the EDM process was invented by two Russian scientists, Dr. B.R. Lazarenko and Dr. N.I. Lazarenko in 1943. 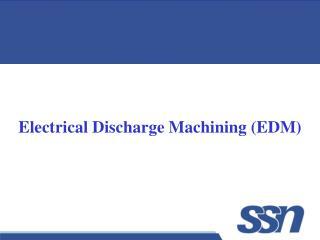 In their efforts to exploit the destructive effects of an electrical discharge, they developed a controlled process for machining of metals. 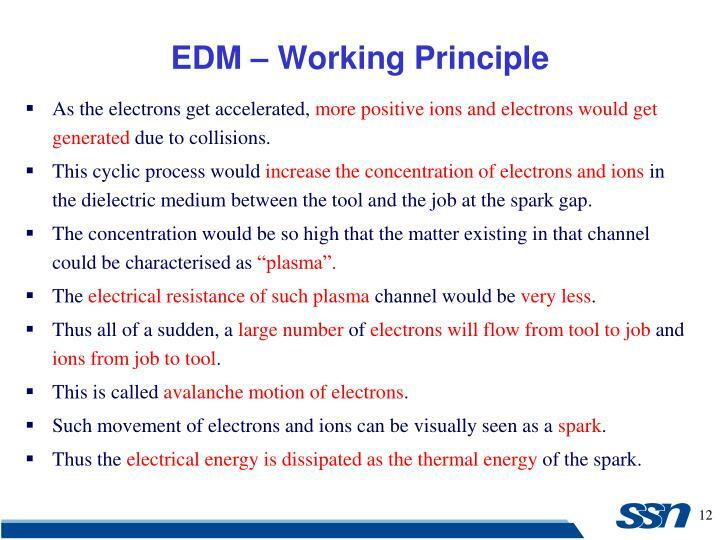 Their initial process used a spark machining process, named after the succession of sparks (electrical discharges) that took place between two electrical conductors immersed in a dielectric fluid. 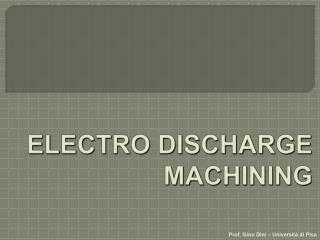 The discharge generator effect used by this machine, known as the Lazarenko Circuit, was used for many years in the construction of generators for electrical discharge. 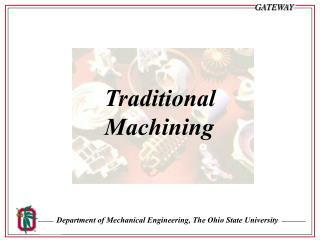 New researchers entered the field and contributed many fundamental characteristics of the machining method we know today. In 1952, the manufacturer Charmilles created the first machine using the spark machining process and was presented for the first time at the European Machine Tool Exhibition in 1955. In 1969, Agie launched the world's first numerically controlled wire-cut EDM machine. 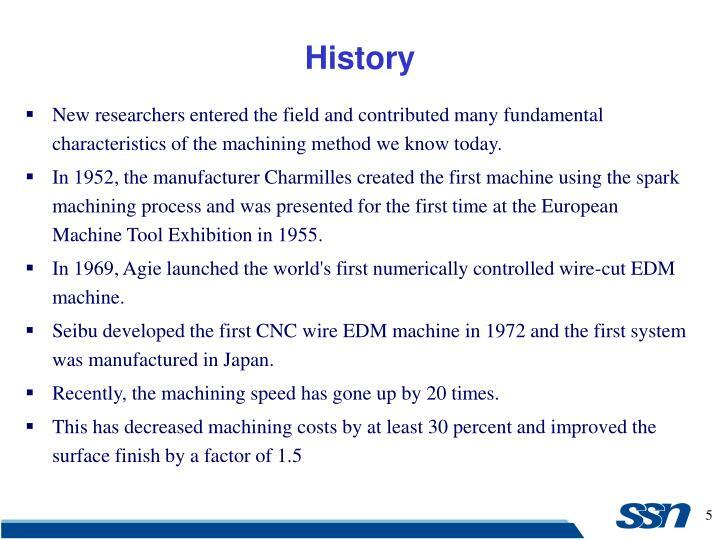 Seibu developed the first CNC wire EDM machine in 1972 and the first system was manufactured in Japan. 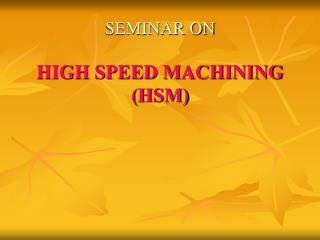 Recently, the machining speed has gone up by 20 times. 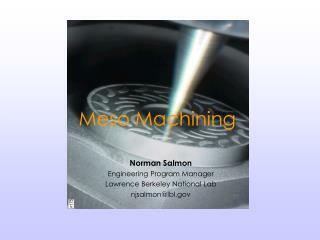 EDM is a machining method primarily used for hard metals or those that would be very difficult to machine with traditional techniques. 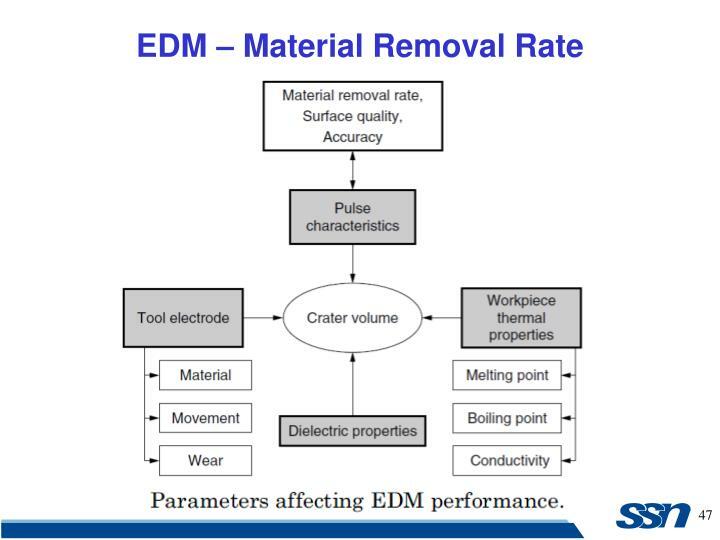 EDM typically works with materials that are electrically conductive, although methods for machining insulating ceramics with EDM have been proposed. EDM can cut intricate contours or cavities in hardened steel without the need for heat treatment to soften and re-harden them. This method can be used with any other metal or metal alloy such as titanium, hastelloy, kovar, and inconel. Also, applications of this process to shape polycrystalline diamond tools have been reported. The work piece and tool are electrically connected to a DC power supply. The current density in the discharge of the channel is of the order of 10000 A/cm2 and power density is nearly 500 MW/cm2. A gap, known as SPARK GAP in the range, from 0.005 mm to 0.05 mm is maintained between the work piece and the tool. Dielectric slurry is forced through this gap at a pressure of 2 kgf/cm2 or lesser. It is a process of metal removal based on the principle of material removal by an interrupted electric spark discharge between the electrode tool and the work piece. 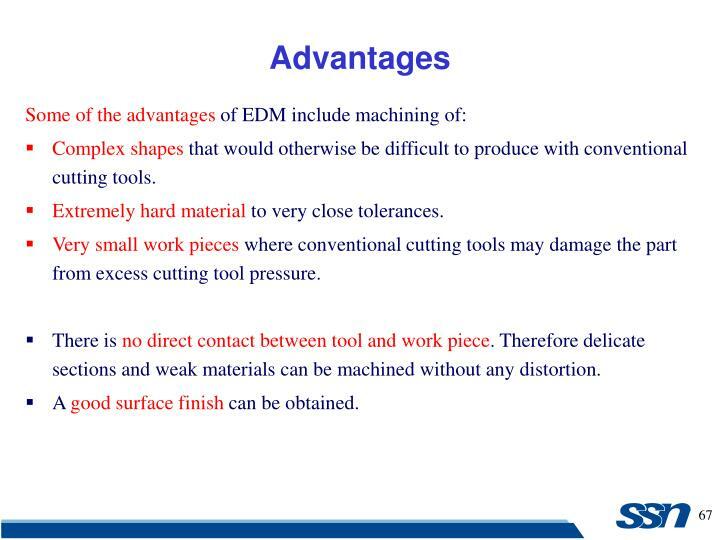 In EDM, a potential difference is applied between the tool and workpiece. Essential - Both tool and work material are to be conductors. The tool and work material are immersed in a dielectric medium. Generally kerosene or deionised water is used as the dielectric medium. A gap is maintained between the tool and the workpiece. Depending upon the applied potential difference (50 to 450 V) and the gap between the tool and workpiece, an electric field would be established. Generally the tool is connected to the negative terminal (cathode)of the generator and the workpiece is connected to positive terminal (anode). As the electric field is established between the tool and the job, the free electrons on the tool are subjected to electrostatic forces. If the bonding energy of the electrons is less, electrons would be emitted from the tool. Such emission of electrons are called or termed as ‘cold emission’. 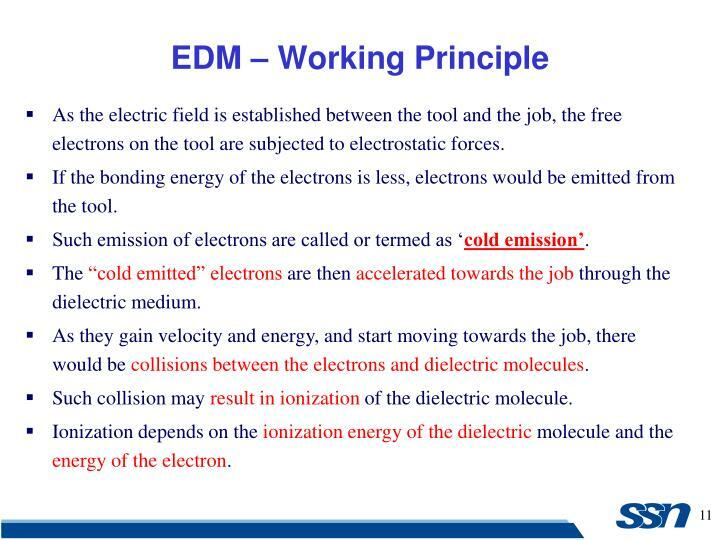 The “cold emitted” electrons are then accelerated towards the job through the dielectric medium. As they gain velocity and energy, and start moving towards the job, there would be collisions between the electrons and dielectric molecules. Such collision may result in ionization of the dielectric molecule. Ionization depends on the ionization energy of the dielectric molecule and the energy of the electron. As the electrons get accelerated, more positive ions and electrons would get generated due to collisions. This cyclic process would increase the concentration of electrons and ions in the dielectric medium between the tool and the job at the spark gap. The concentration would be so high that the matter existing in that channel could be characterised as “plasma”. The electrical resistance of such plasma channel would be very less. Thus all of a sudden, a large number of electrons will flow from tool to job and ions from job to tool. This is called avalanche motion of electrons. Such movement of electrons and ions can be visually seen as a spark. Thus the electrical energy is dissipated as the thermal energy of the spark. The high speed electrons then impinge on the job and ions on the tool. 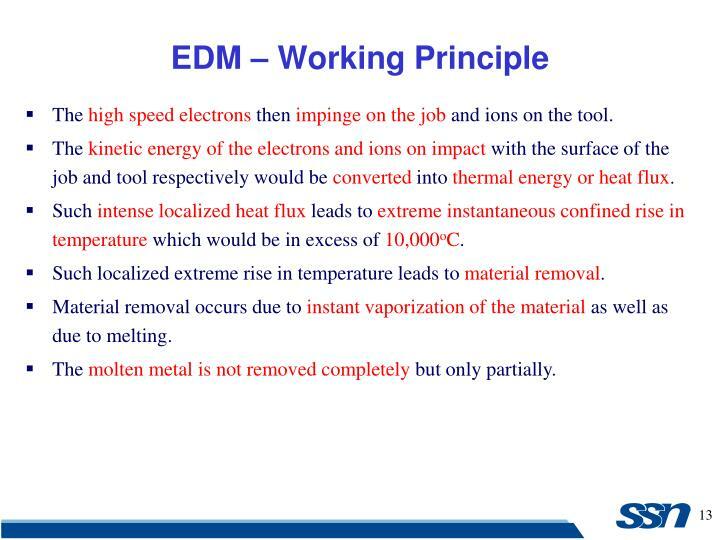 The kinetic energy of the electrons and ions on impact with the surface of the job and tool respectively would be converted into thermal energy or heat flux. Such intense localized heat flux leads to extreme instantaneous confined rise in temperature which would be in excess of 10,000oC. Such localized extreme rise in temperature leads to material removal. Material removal occurs due to instant vaporization of the material as well as due to melting. The molten metal is not removed completely but only partially. Upon withdrawal of potential difference, plasma channel collapses. This ultimately creates compression shock waves on both the electrode surface. Particularly at high spots on work piece surface, which are closest to the tool. This evacuates molten material and forms a crater around the site of the spark. The whole sequence of operation occurs within a few microseconds. Generally the workpiece is made positive and the tool negative. Hence, the electrons strike the job leading to crater formation due to high temperature and melting and material removal. Similarly, the positive ions impinge on the tool leading to tool wear. 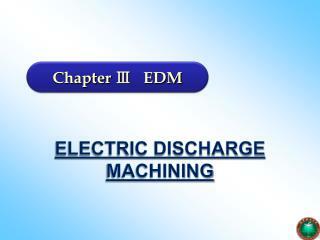 In EDM, the generator is used to apply voltage pulses between the tool and job. A constant voltage is not applied. Only sparking is desired rather than arcing. 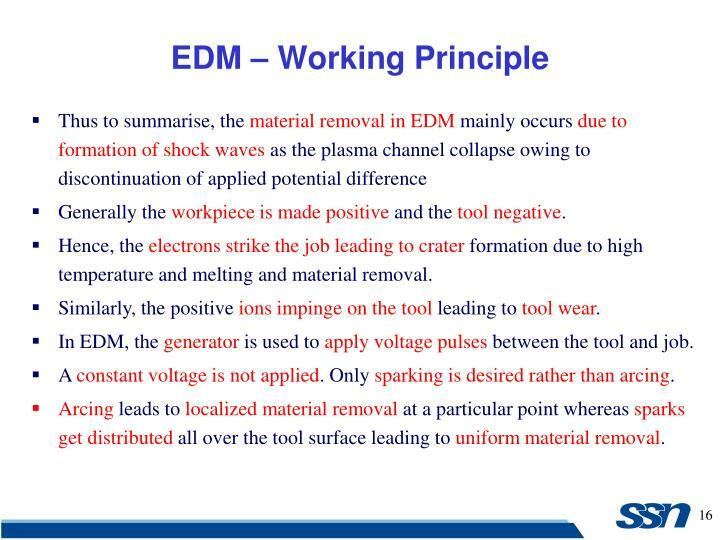 Arcing leads to localized material removal at a particular point whereas sparks get distributed all over the tool surface leading to uniform material removal. 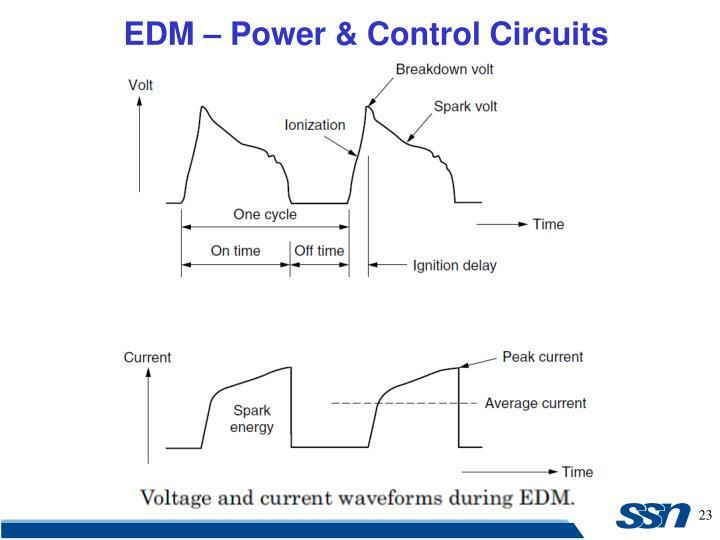 Two broad categories of generators (power supplies) are in use on EDM. Commercially available: RC circuits based and transistor controlled pulses. In the first category, the main parameters to choose from at setup time are the resistance(s) of the resistor(s) and the capacitance(s) of the capacitor(s). 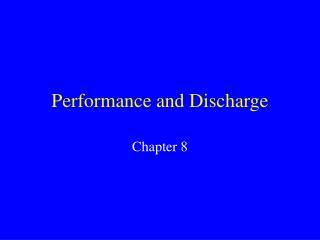 In an ideal condition, these quantities would affect the maximum current delivered in a discharge. 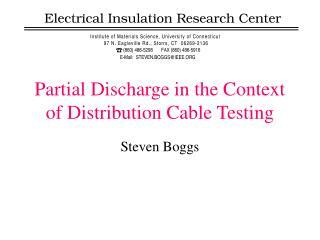 Current delivery in a discharge is associated with the charge accumulated on the capacitors at a certain moment. 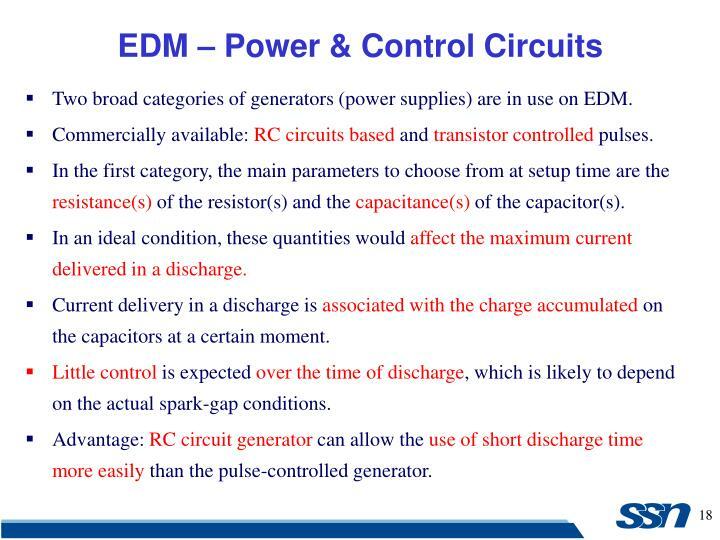 Little control is expected over the time of discharge, which is likely to depend on the actual spark-gap conditions. Advantage: RC circuit generator can allow the use of short discharge time more easily than the pulse-controlled generator. Also, the open circuit voltage (i.e. 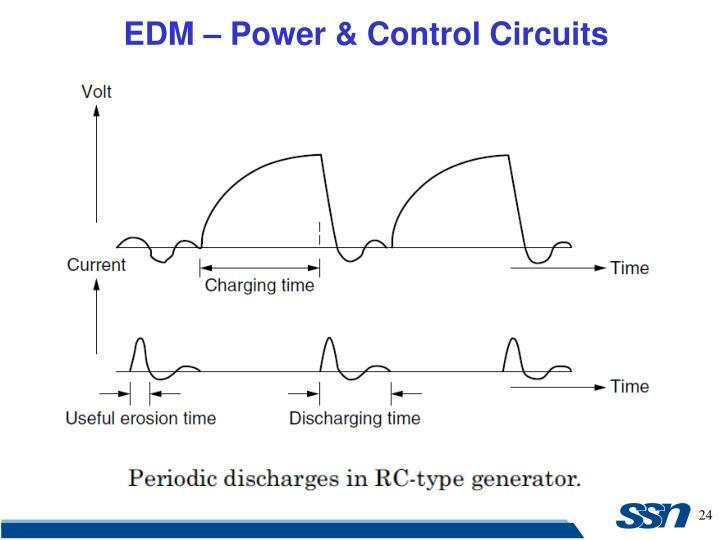 voltage between electrodes when dielectric is not broken) can be identified as steady state voltage of the RC circuit. In generators based on transistor control, the user is usually able to deliver a train of voltage pulses to the electrodes. Each pulse can be controlled in shape, for instance, quasi-rectangular. In particular, the time between two consecutive pulses and the duration of each pulse can be set. The amplitude of each pulse constitutes the open circuit voltage. 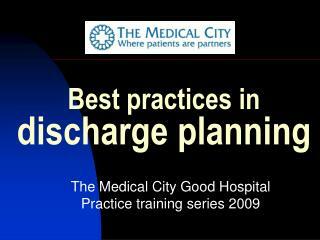 Thus, maximum duration of discharge is equal to duration of a voltage pulse. Maximum current during a discharge that the generator delivers can also be controlled. 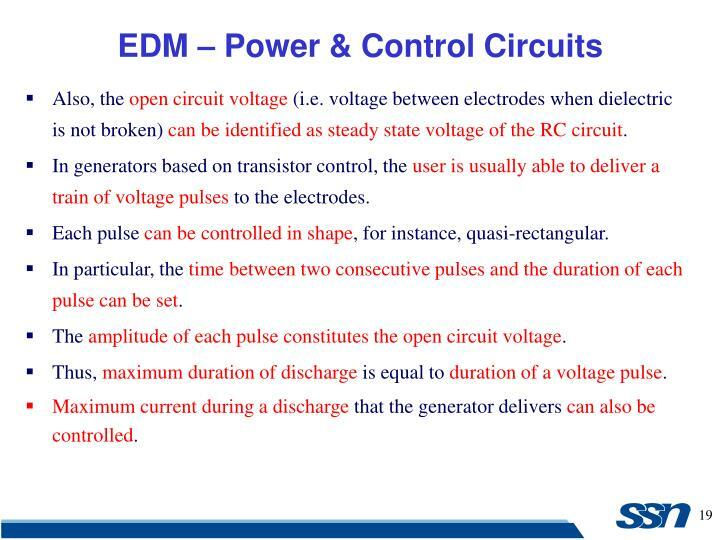 Details of generators and control systems on EDMs are not always easily available to their user. 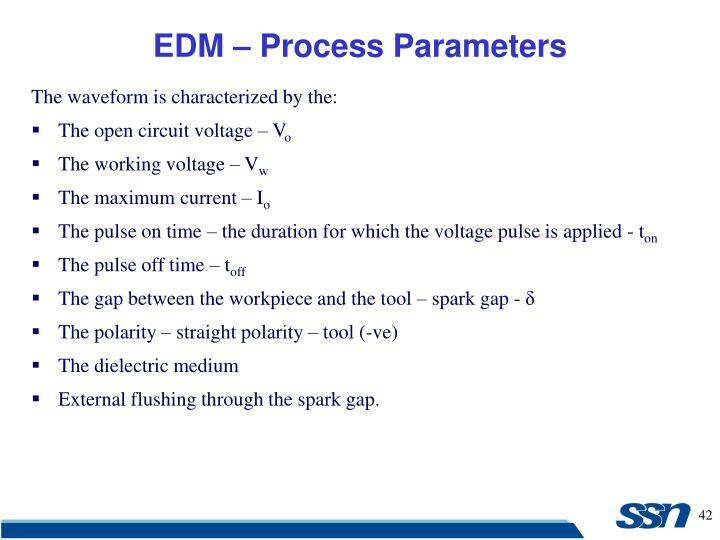 This is a barrier to describing the technological parameters of EDM process. 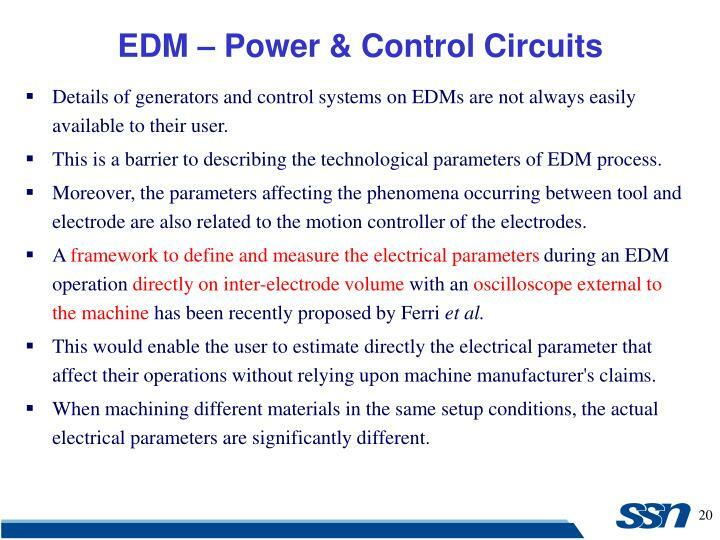 Moreover, the parameters affecting the phenomena occurring between tool and electrode are also related to the motion controller of the electrodes. 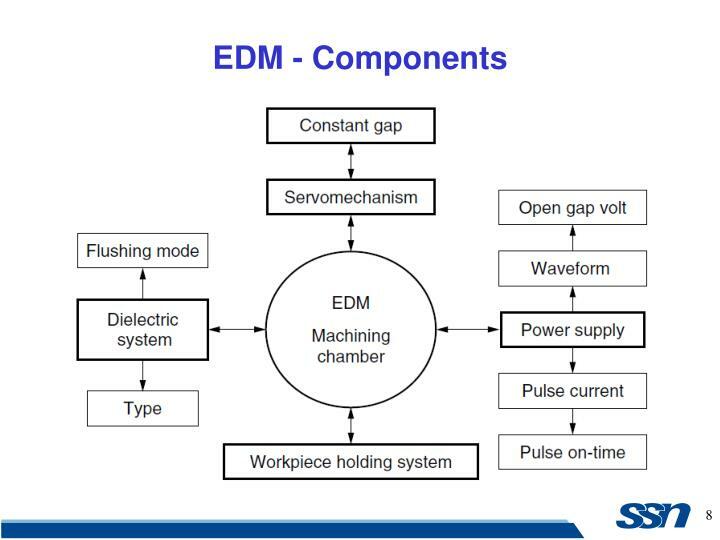 A framework to define and measure the electrical parameters during an EDM operation directly on inter-electrode volume with an oscilloscope external to the machine has been recently proposed by Ferri et al. This would enable the user to estimate directly the electrical parameter that affect their operations without relying upon machine manufacturer's claims. 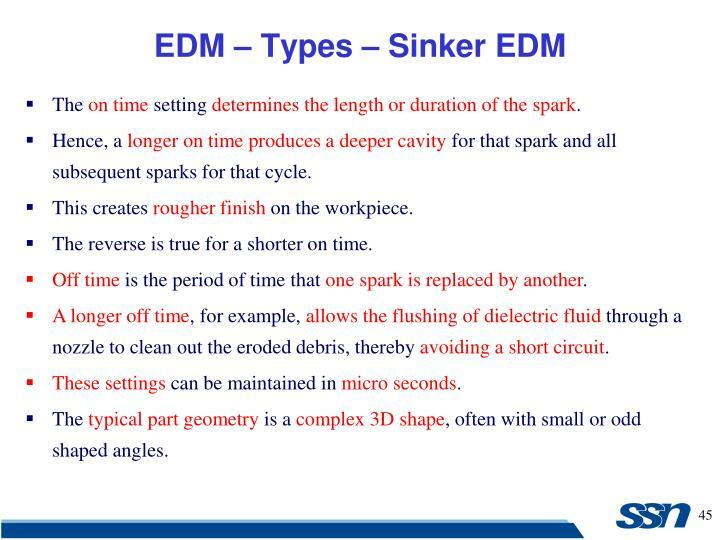 When machining different materials in the same setup conditions, the actual electrical parameters are significantly different. 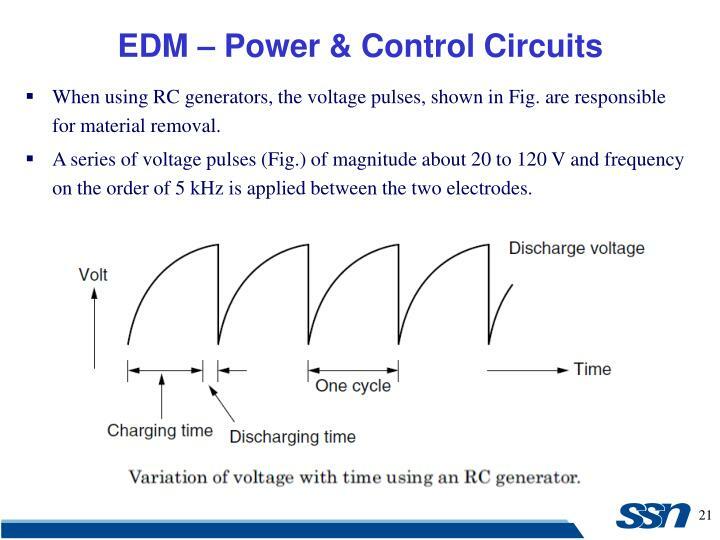 When using RC generators, the voltage pulses, shown in Fig. are responsible for material removal. A series of voltage pulses (Fig.) of magnitude about 20 to 120 V and frequency on the order of 5 kHz is applied between the two electrodes. 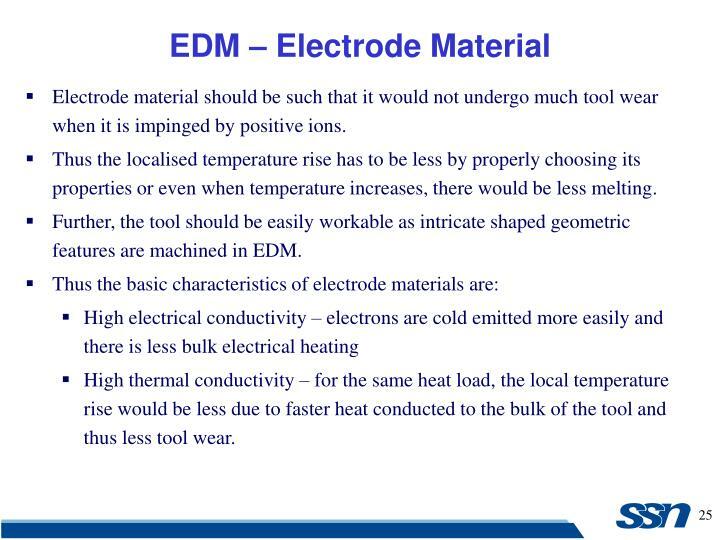 Electrode material should be such that it would not undergo much tool wear when it is impinged by positive ions. Thus the localised temperature rise has to be less by properly choosing its properties or even when temperature increases, there would be less melting. Further, the tool should be easily workable as intricate shaped geometric features are machined in EDM. High thermal conductivity – for the same heat load, the local temperature rise would be less due to faster heat conducted to the bulk of the tool and thus less tool wear. Graphite (most common) - has fair wear characteristics, easily machinable. Small flush holes can be drilled into graphite electrodes. 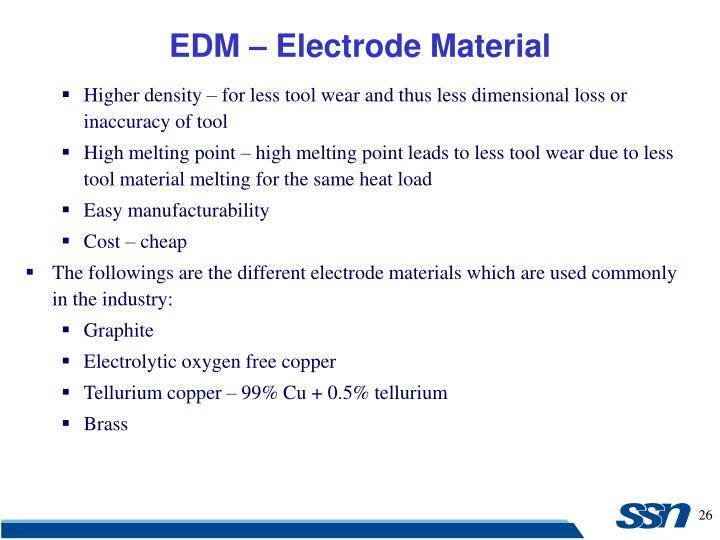 Copper has good EDM wear and better conductivity. It is generally used for better finishes in the range of Ra = 0.5 μm. Copper tungsten and silver tungsten are used for making deep slots under poor flushing conditions especially in tungsten carbides. It offers high machining rates as well as low electrode wear. Copper graphite is good for cross-sectional electrodes. It has better electrical conductivity than graphite while the corner wear is higher. Brass ensures stable sparking conditions and is normally used for specialized applications such as drilling of small holes where the high electrode wear is acceptable. 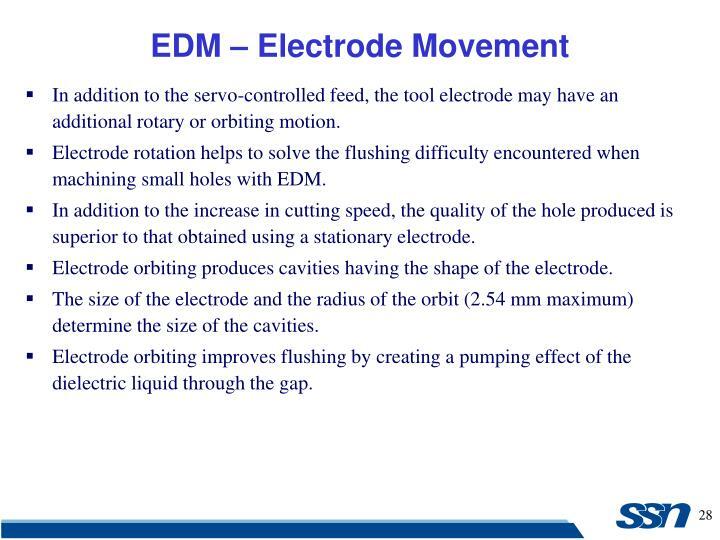 In addition to the servo-controlled feed, the tool electrode may have an additional rotary or orbiting motion. 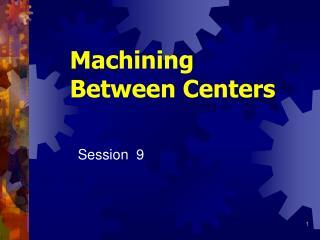 Electrode rotation helps to solve the flushing difficulty encountered when machining small holes with EDM. In addition to the increase in cutting speed, the quality of the hole produced is superior to that obtained using a stationary electrode. Electrode orbiting produces cavities having the shape of the electrode. The size of the electrode and the radius of the orbit (2.54 mm maximum) determine the size of the cavities. Electrode orbiting improves flushing by creating a pumping effect of the dielectric liquid through the gap. The melting point is the most important factor in determining the tool wear. 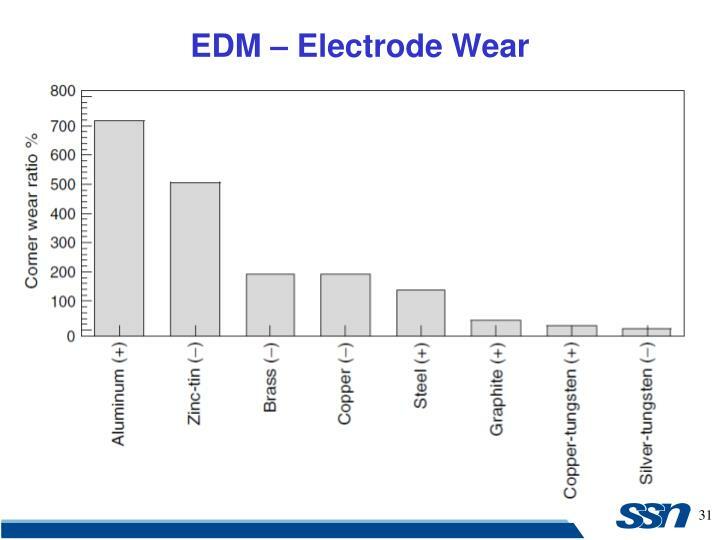 Electrode wear ratios are expressed as end wear, side wear, corner wear, and volume wear. 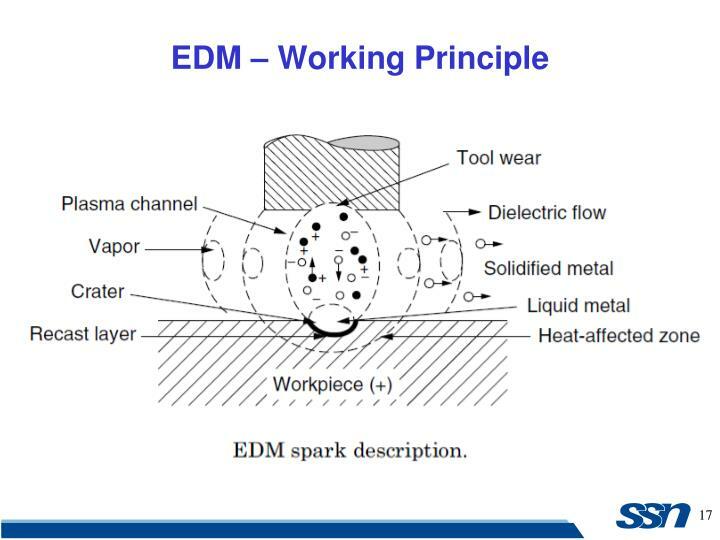 “No wear EDM” - when the electrode-to-workpiece wear ratio is 1 % or less. 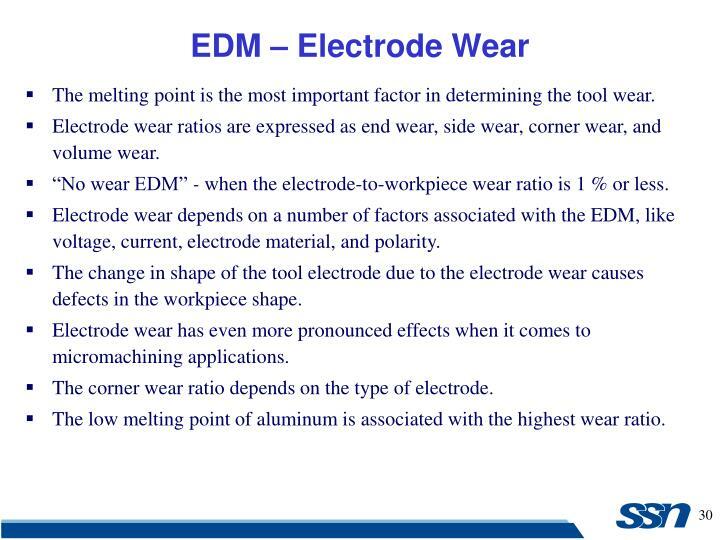 Electrode wear depends on a number of factors associated with the EDM, like voltage, current, electrode material, and polarity. The change in shape of the tool electrode due to the electrode wear causes defects in the workpiece shape. 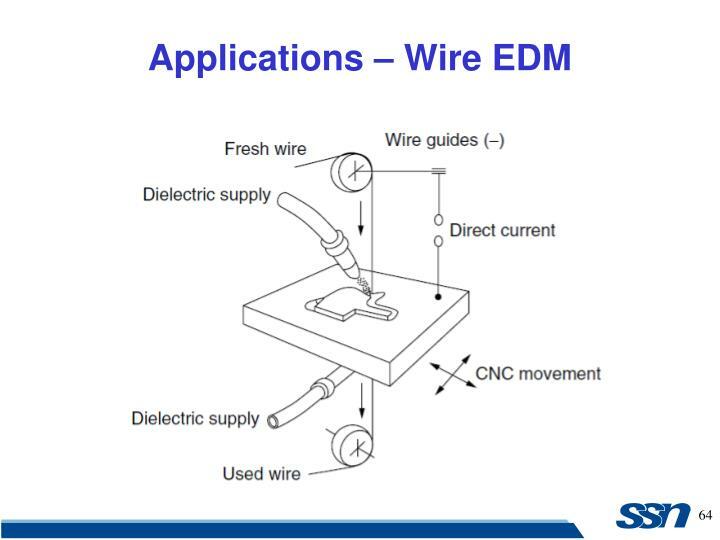 Electrode wear has even more pronounced effects when it comes to micromachining applications. The corner wear ratio depends on the type of electrode. The low melting point of aluminum is associated with the highest wear ratio. Graphite has shown a low tendency to wear and has the possibility of being molded or machined into complicated electrode shapes. 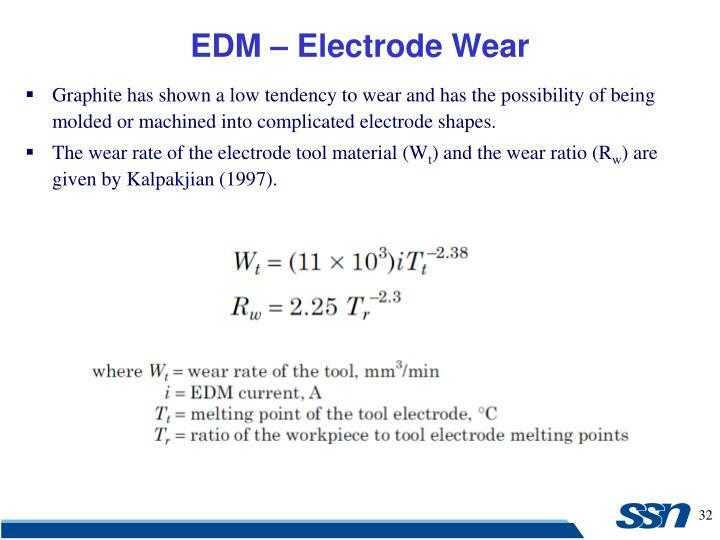 The wear rate of the electrode tool material (Wt)and the wear ratio (Rw) are given by Kalpakjian (1997). 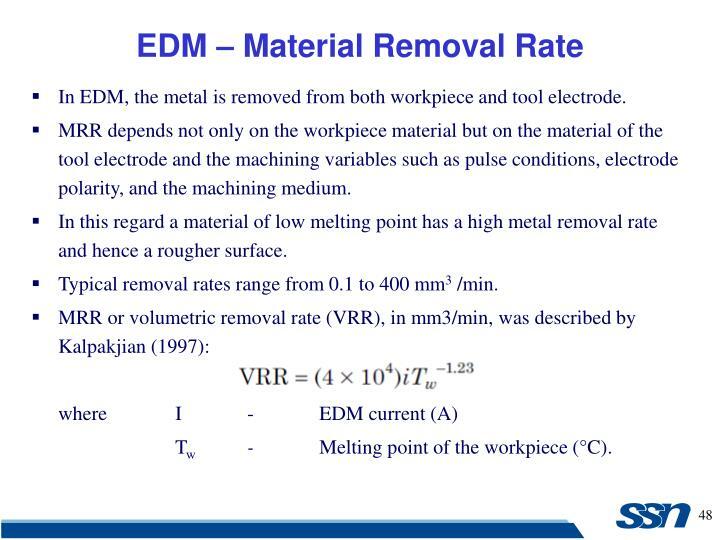 In EDM, material removal mainly occurs due to thermal evaporation and melting. As thermal processing is required to be carried out in absence of oxygen so that the process can be controlled and oxidation avoided. 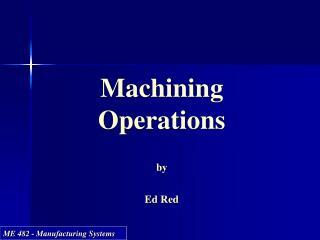 Oxidation often leads to poor surface conductivity (electrical) of the workpiece hindering further machining. Hence, dielectric fluid should provide an oxygen free machining environment. Further it should have enough strong dielectric resistance so that it does not breakdown electrically too easily. But at the same time, it should ionize when electrons collide with its molecule. Moreover, during sparking it should be thermally resistant as well. 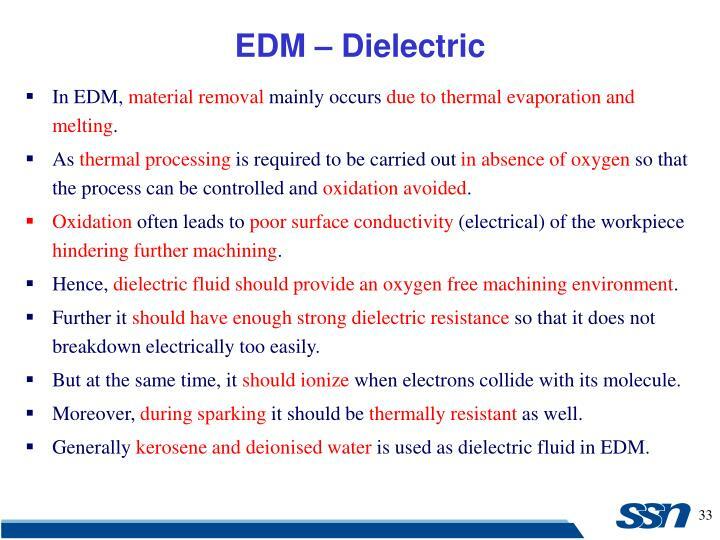 Generally kerosene and deionised water is used as dielectric fluid in EDM. Tap water cannot be used as it ionises too early and thus breakdown due to presence of salts as impurities occur. 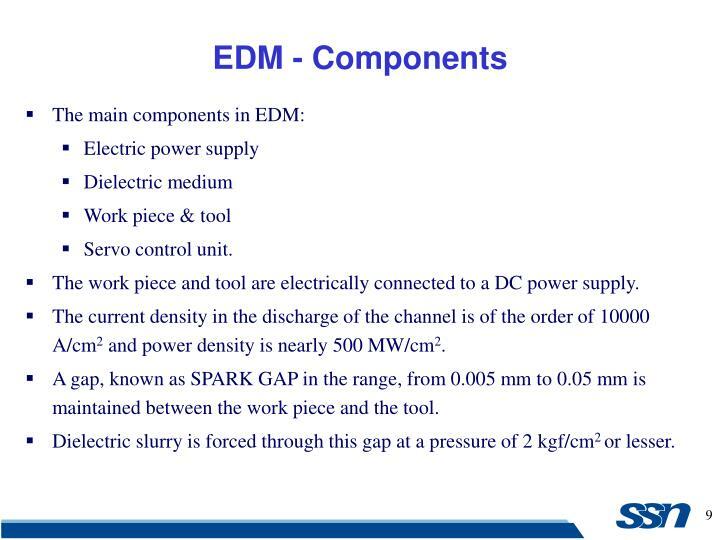 Dielectric medium is generally flushed around the spark zone. It is also applied through the tool to achieve efficient removal of molten material. Insulates the gap between the tool and work, thus preventing a spark to form until the gap voltage are correct. Cools the electrode, workpiece and solidifies the molten metal particles. Flushes the metal particles out of the working gap to maintain ideal cutting conditions, increase metal removal rate. It must be filtered and circulated at constant pressure. 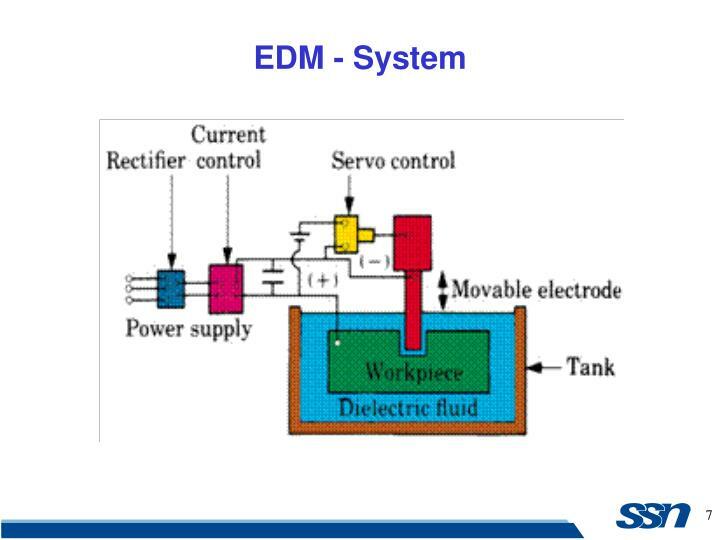 The main requirements of the EDM dielectric fluids are adequate viscosity, high flash point, good oxidation stability, minimum odor, low cost, and good electrical discharge efficiency. For most EDM operations kerosene is used with certain additives that prevent gas bubbles and de-odoring. Silicon fluids and a mixture of these fluids with petroleum oils have given excellent results. 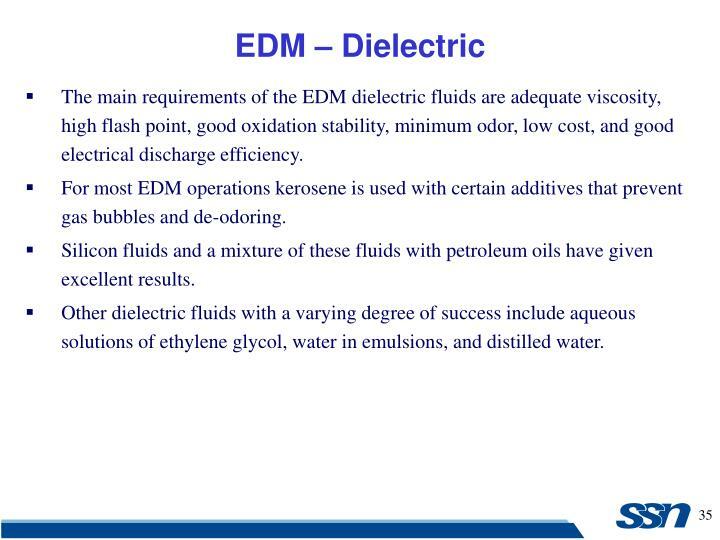 Other dielectric fluids with a varying degree of success include aqueous solutions of ethylene glycol, water in emulsions, and distilled water. 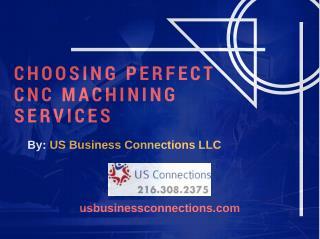 One of the important factors in a successful EDM operation is the removal of debris (chips) from the working gap. Flushing these particles out of the working gap is very important, to prevent them from forming bridges that cause short circuits. 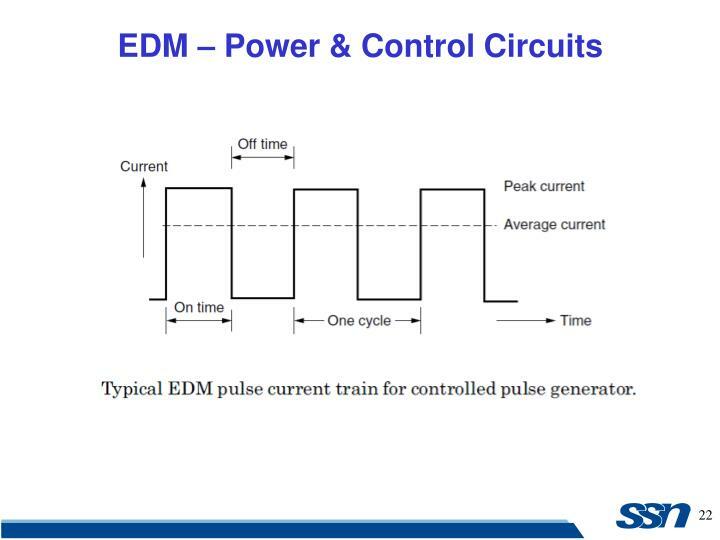 EDMs have a built-in power adaptive control system that increases the pulse spacing as soon as this happens and reduces or shuts off the power supply. Flushing – process of introducing clean filtered dielectric fluid into spark gap. 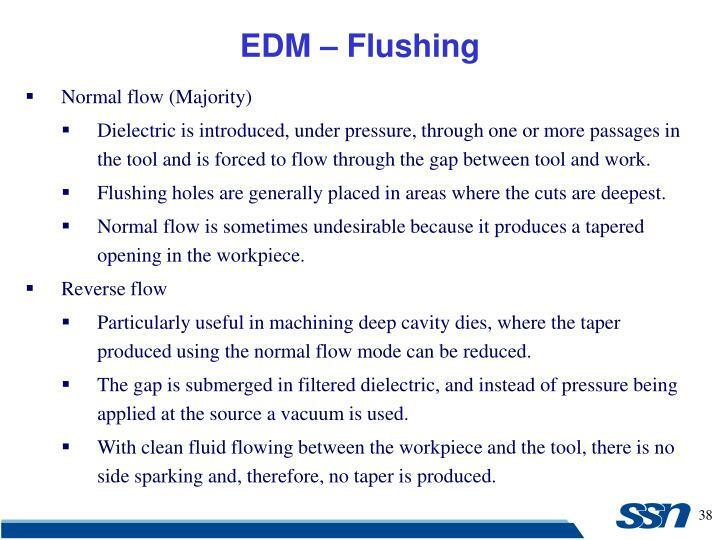 If flushing is applied incorrectly, it can result in erratic cutting and poor machining conditions. Flushing of dielectric plays a major role in the maintenance of stable machining and the achievement of close tolerance and high surface quality. Inadequate flushing can result in arcing, decreased electrode life, and increased production time. Dielectric is introduced, under pressure, through one or more passages in the tool and is forced to flow through the gap between tool and work. Flushing holes are generally placed in areas where the cuts are deepest. Normal flow is sometimes undesirable because it produces a tapered opening in the workpiece. 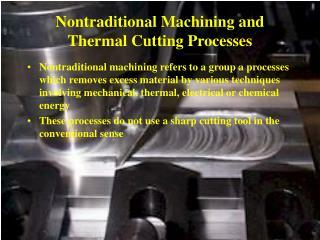 Particularly useful in machining deep cavity dies, where the taper produced using the normal flow mode can be reduced. The gap is submerged in filtered dielectric, and instead of pressure being applied at the source a vacuum is used. With clean fluid flowing between the workpiece and the tool, there is no side sparking and, therefore, no taper is produced. In many instances, the desired machining can be achieved by using a spray or jet of fluid directed against the machining gap. 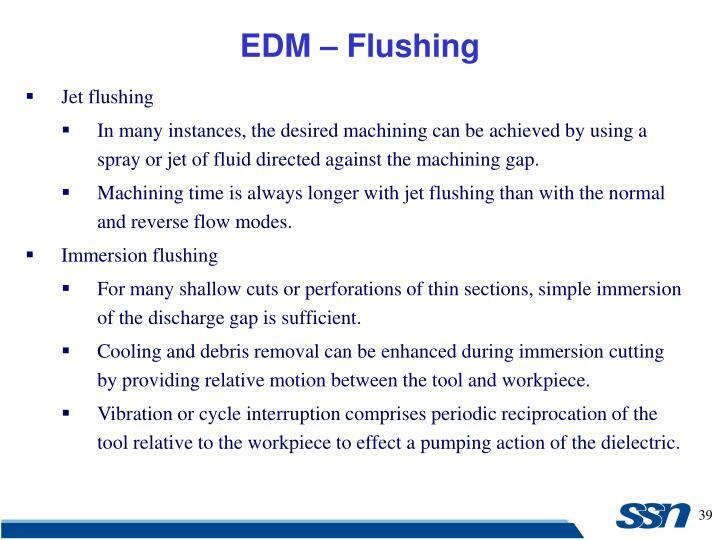 Machining time is always longer with jet flushing than with the normal and reverse flow modes. 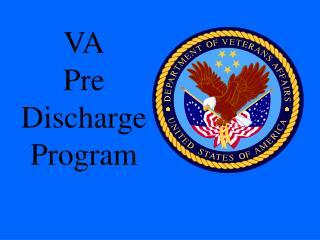 For many shallow cuts or perforations of thin sections, simple immersion of the discharge gap is sufficient. Cooling and debris removal can be enhanced during immersion cutting by providing relative motion between the tool and workpiece. Vibration or cycle interruption comprises periodic reciprocation of the tool relative to the workpiece to effect a pumping action of the dielectric. Synchronized, pulsed flushing is also available on some machines. 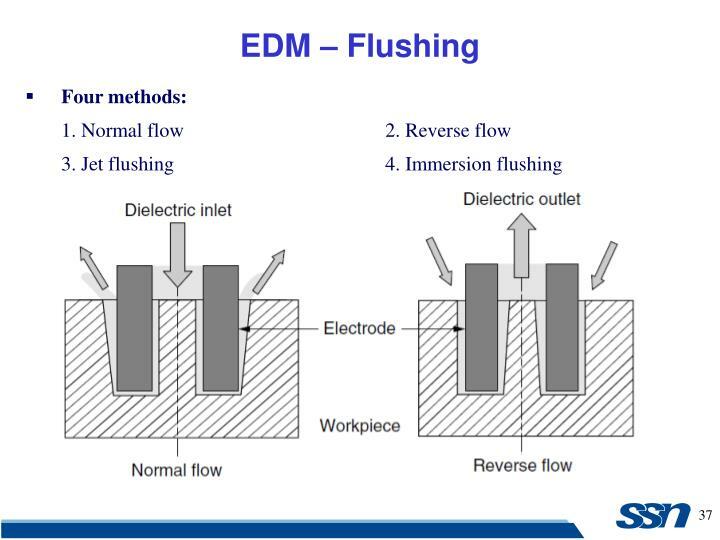 With this method, flushing occurs only during the non-machining time as the electrode is retracted slightly to enlarge the gap. 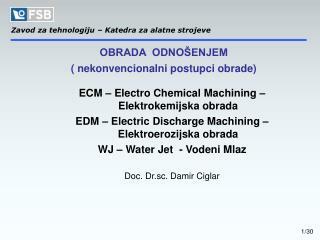 Increased electrode life has been reported with this system. 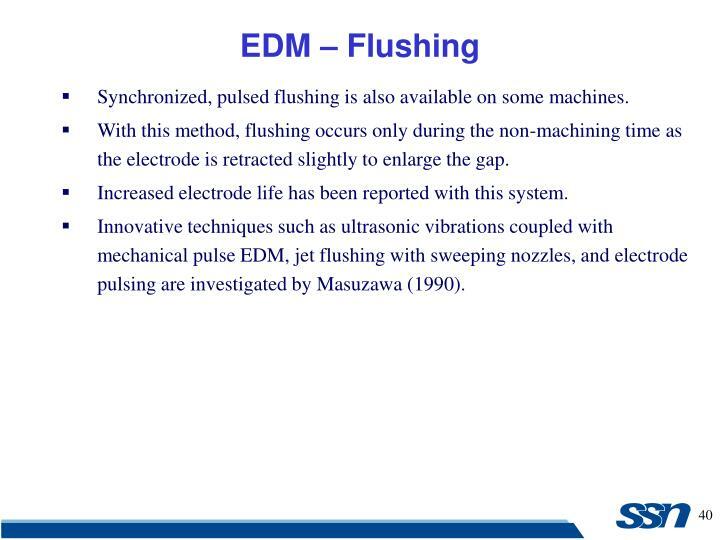 Innovative techniques such as ultrasonic vibrations coupled with mechanical pulse EDM, jet flushing with sweeping nozzles, and electrode pulsing are investigated by Masuzawa (1990). 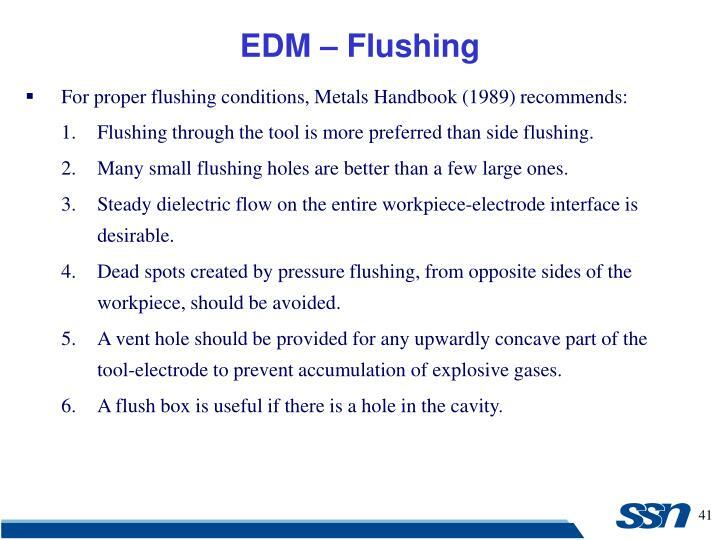 Flushing through the tool is more preferred than side flushing. Many small flushing holes are better than a few large ones. Steady dielectric flow on the entire workpiece-electrode interface is desirable. Dead spots created by pressure flushing, from opposite sides of the workpiece, should be avoided. A vent hole should be provided for any upwardly concave part of the tool-electrode to prevent accumulation of explosive gases. A flush box is useful if there is a hole in the cavity. External flushing through the spark gap. 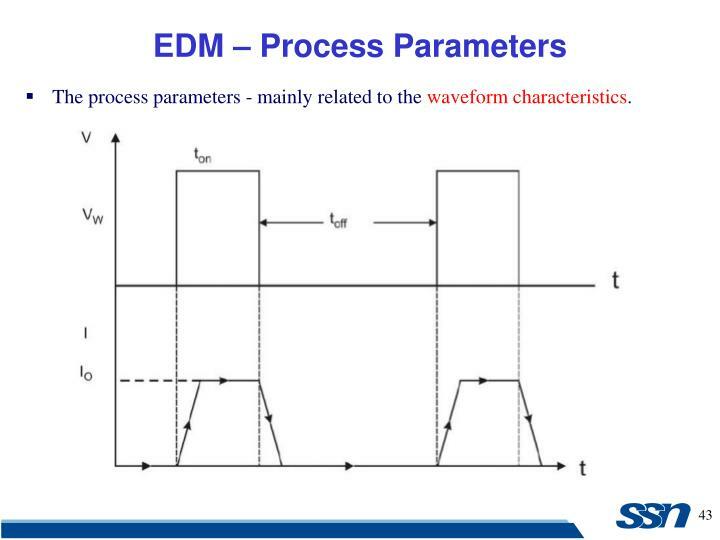 The process parameters - mainly related to the waveform characteristics. 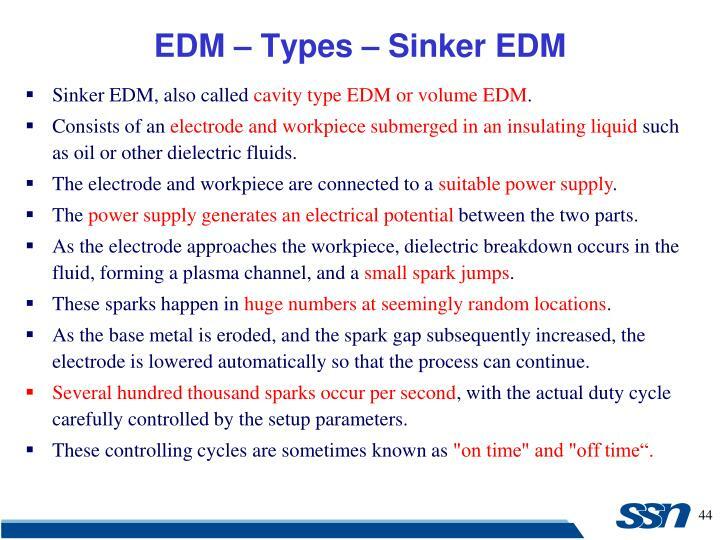 Sinker EDM, also called cavity type EDM or volume EDM. 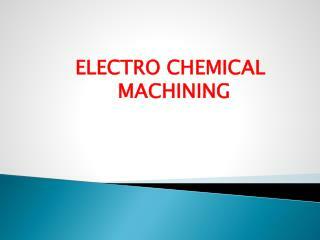 Consists of an electrode and workpiece submerged in an insulating liquid such as oil or other dielectric fluids. The electrode and workpiece are connected to a suitable power supply. The power supply generates an electrical potential between the two parts. As the electrode approaches the workpiece, dielectric breakdown occurs in the fluid, forming a plasma channel, and a small spark jumps. These sparks happen in huge numbers at seemingly random locations. 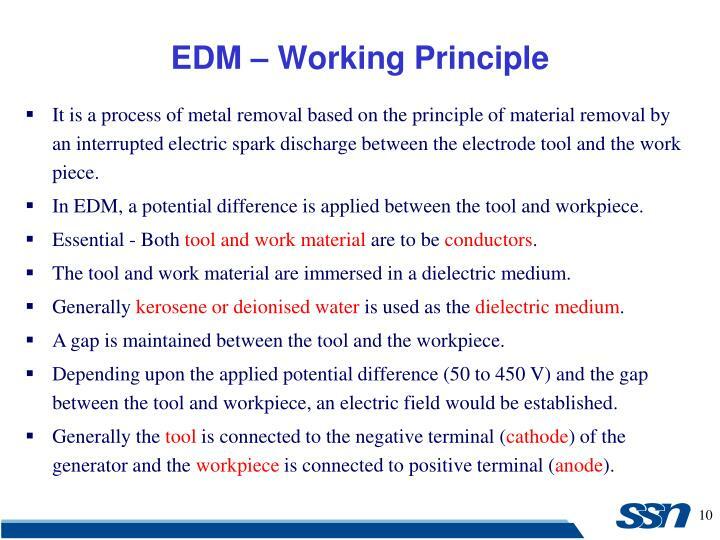 As the base metal is eroded, and the spark gap subsequently increased, the electrode is lowered automatically so that the process can continue. Several hundred thousand sparks occur per second, with the actual duty cycle carefully controlled by the setup parameters. These controlling cycles are sometimes known as "on time" and "off time“. The on time setting determines the length or duration of the spark. Hence, a longer on time produces a deeper cavity for that spark and all subsequent sparks for that cycle. This creates rougher finish on the workpiece. The reverse is true for a shorter on time. Off time is the period of time that one spark is replaced by another. A longer off time, for example, allows the flushing of dielectric fluid through a nozzle to clean out the eroded debris, thereby avoiding a short circuit. These settings can be maintained in micro seconds. The typical part geometry is a complex 3D shape, often with small or odd shaped angles. Also known as wire-cut EDM and wire cutting. 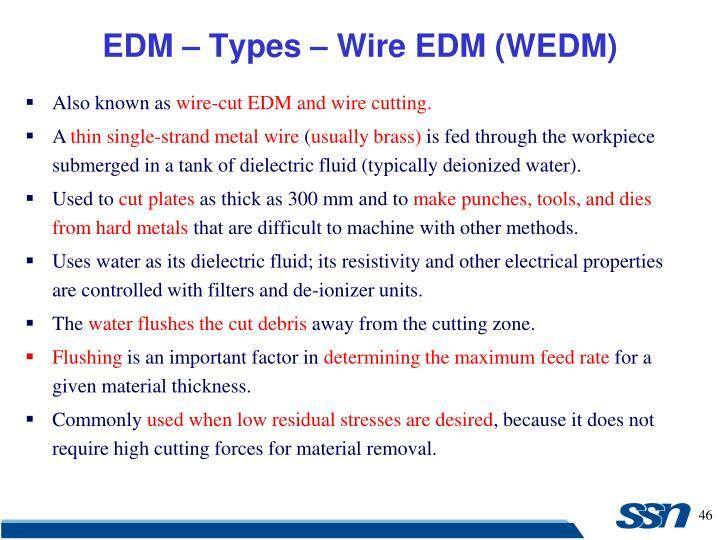 A thin single-strand metal wire (usually brass) is fed through the workpiece submerged in a tank of dielectric fluid (typically deionized water). Used to cut plates as thick as 300 mm and to make punches, tools, and dies from hard metals that are difficult to machine with other methods. Uses water as its dielectric fluid; its resistivity and other electrical properties are controlled with filters and de-ionizer units. The water flushes the cut debris away from the cutting zone. Flushing is an important factor in determining the maximum feed rate for a given material thickness. Commonly used when low residual stresses are desired, because it does not require high cutting forces for material removal. 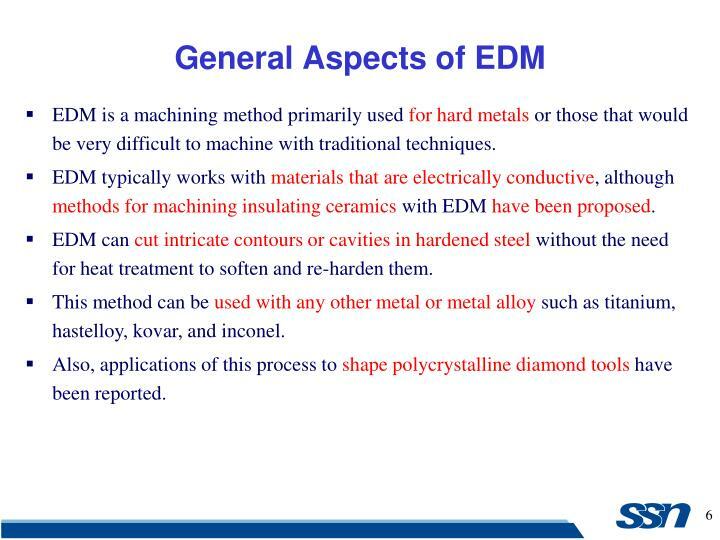 In EDM, the metal is removed from both workpiece and tool electrode. MRR depends not only on the workpiece material but on the material of the tool electrode and the machining variables such as pulse conditions, electrode polarity, and the machining medium. In this regard a material of low melting point has a high metal removal rate and hence a rougher surface. Typical removal rates range from 0.1 to 400 mm3 /min. Tw -	Melting point of the workpiece (°C). 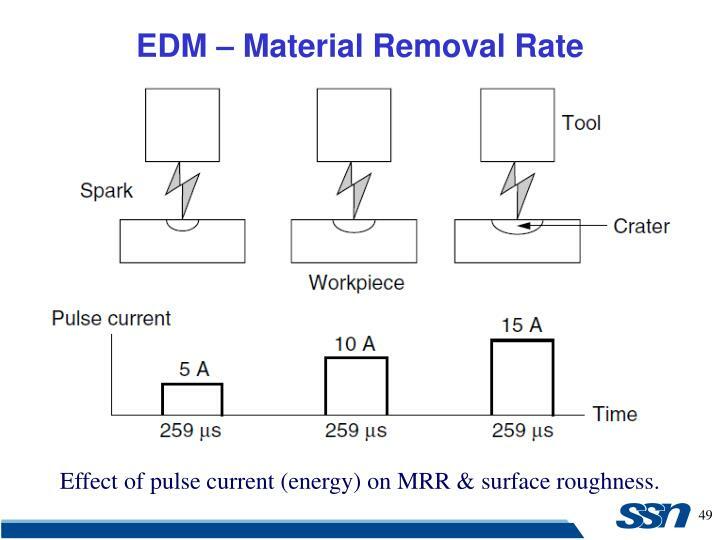 Effect of pulse current (energy) on MRR & surface roughness. Effect of pulse on-time (energy) on MRR & surface roughness. Surface consists of a multitude of overlapping craters that are formed by the action of microsecond-duration spark discharges. 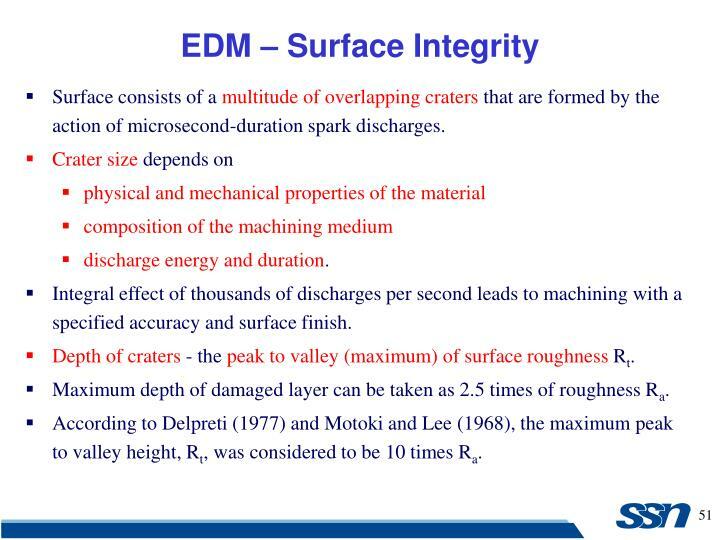 Integral effect of thousands of discharges per second leads to machining with a specified accuracy and surface finish. Depth of craters - the peak to valley (maximum) of surface roughness Rt. Maximum depth of damaged layer can be taken as 2.5 times of roughness Ra. According to Delpreti (1977) and Motoki and Lee (1968), the maximum peak to valley height, Rt, was considered to be 10 times Ra. 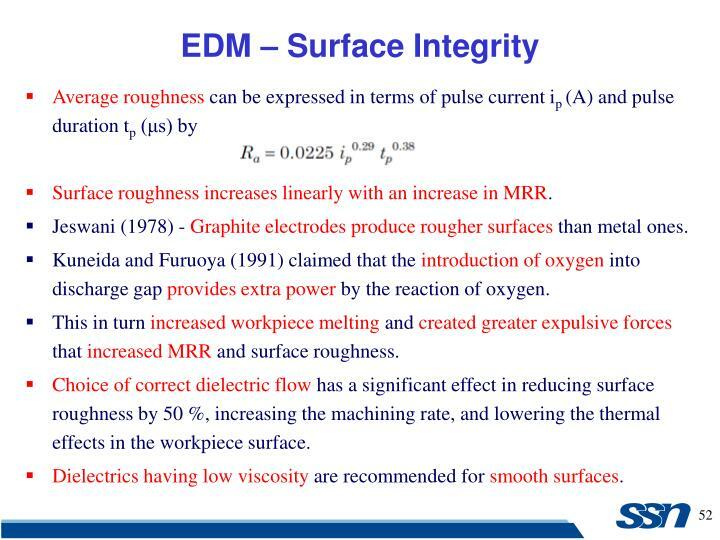 Surface roughness increases linearly with an increase in MRR. Jeswani (1978) - Graphite electrodes produce rougher surfaces than metal ones. Kuneida and Furuoya (1991) claimed that the introduction of oxygen into discharge gap provides extra power by the reaction of oxygen. 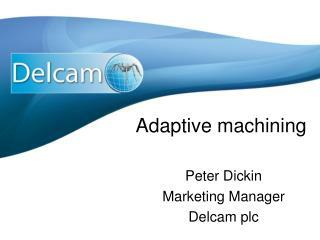 This in turn increased workpiece melting and created greater expulsive forces that increased MRR and surface roughness. Choice of correct dielectric flow has a significant effect in reducing surface roughness by 50 %, increasing the machining rate, and lowering the thermal effects in the workpiece surface. Dielectrics having low viscosity are recommended for smooth surfaces. Metallurgical changes occur in the surface – Temperature 8000 to 12,000°C. Additionally, a thin recast layer of 1 μm to 25 μm – depending on power used. Delpretti (1977) and Levy and Maggi (1990) claimed that the heat-affected zone (HAZ) adjacent to the resolidified layer reaches 25 μm. Some annealing can be expected in a zone just below the machined surface. 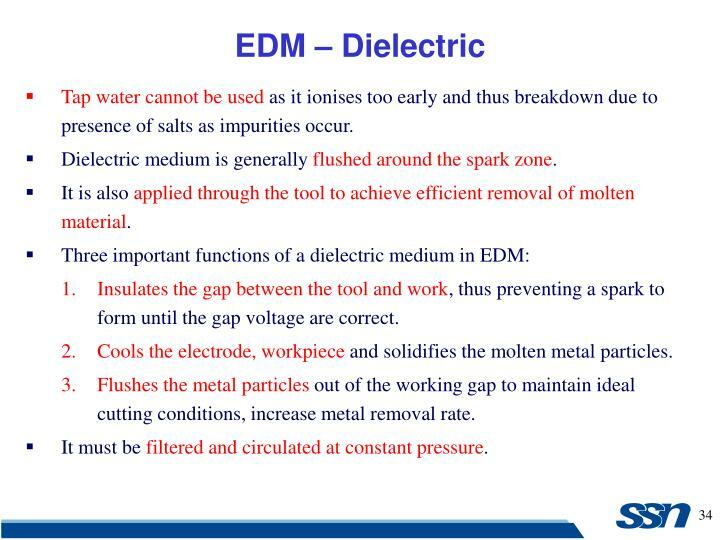 Not all the workpiece melted by discharge is expelled into the dielectric. Remaining melted material is quickly chilled, primarily by heat conduction into the bulk of the workpiece, resulting in an exceedingly hard surface. Depth of annealed layer is proportional to power used. It ranges from 50 μm for finish cutting to ~ 200 μm for high MRR. Annealing is usually about two points of hardness below the parent metal for finish cutting. In roughing cuts, the annealing effect is ~ five points of hardness below the parent metal. Electrodes that produce more stable machining can reduce the annealing effect. A finish cut removes the annealed material left by the previous rough cut. 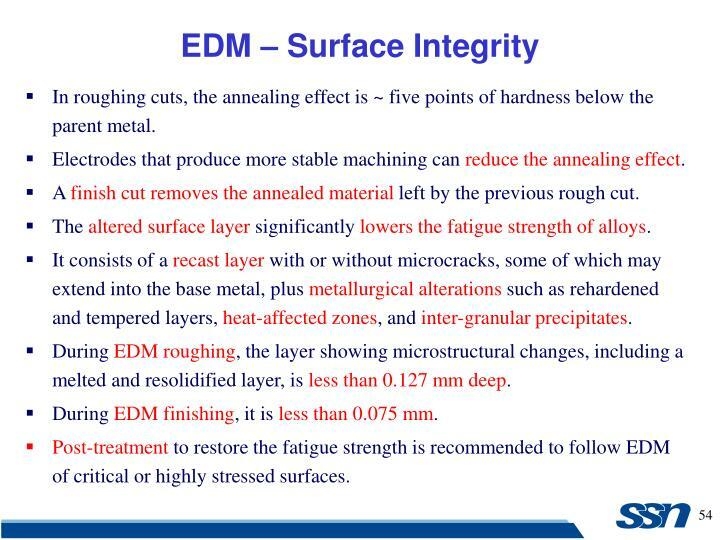 The altered surface layer significantly lowers the fatigue strength of alloys. It consists of a recast layer with or without microcracks, some of which may extend into the base metal, plus metallurgical alterations such as rehardened and tempered layers, heat-affected zones, and inter-granular precipitates. 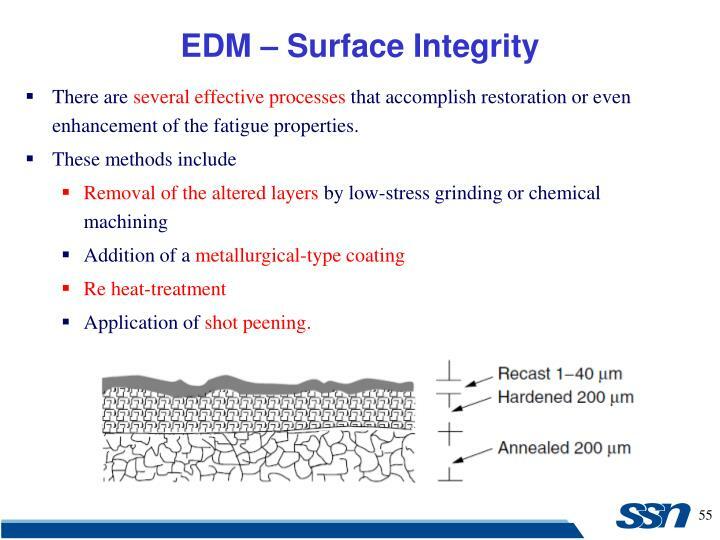 During EDM roughing, the layer showing microstructural changes, including a melted and resolidified layer, is less than 0.127 mm deep. During EDM finishing, it is less than 0.075 mm. Post-treatment to restore the fatigue strength is recommended to follow EDM of critical or highly stressed surfaces. There are several effective processes that accomplish restoration or even enhancement of the fatigue properties. Can be used to machine any work material if it is electrically conductive. 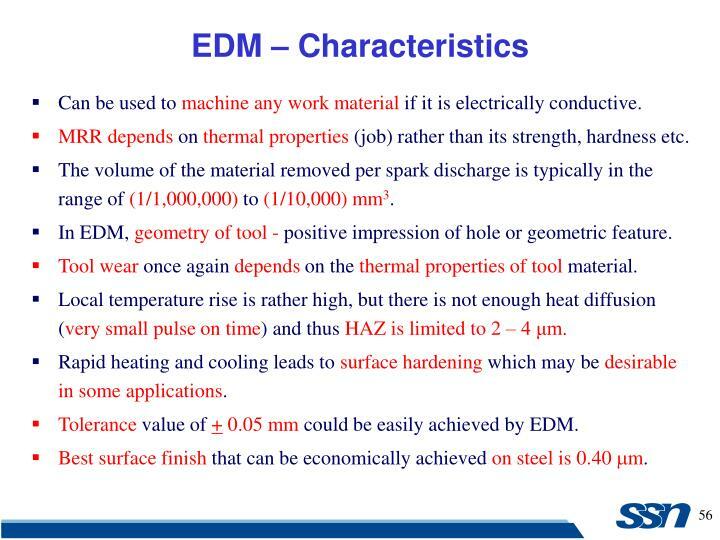 MRR depends on thermal properties (job) rather than its strength, hardness etc. 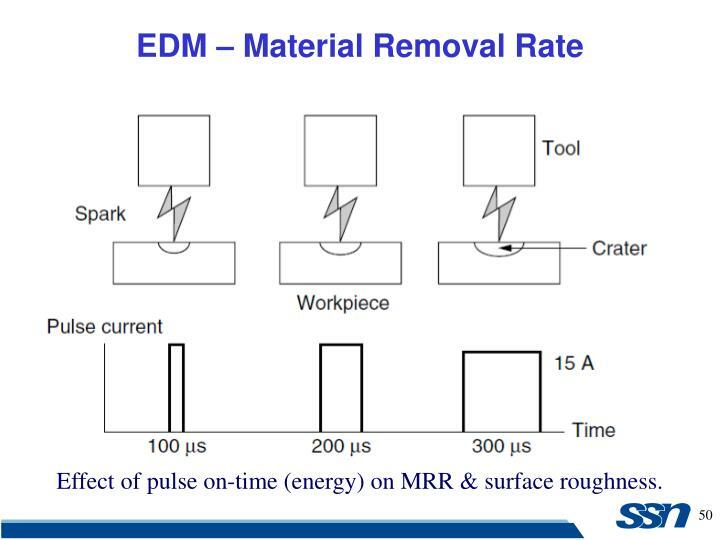 The volume of the material removed per spark discharge is typically in the range of (1/1,000,000) to (1/10,000) mm3. In EDM, geometry of tool - positive impression of hole or geometric feature. Tool wear once again depends on the thermal properties of tool material. Local temperature rise is rather high, but there is not enough heat diffusion (very small pulse on time) and thus HAZ is limited to 2 – 4 μm. 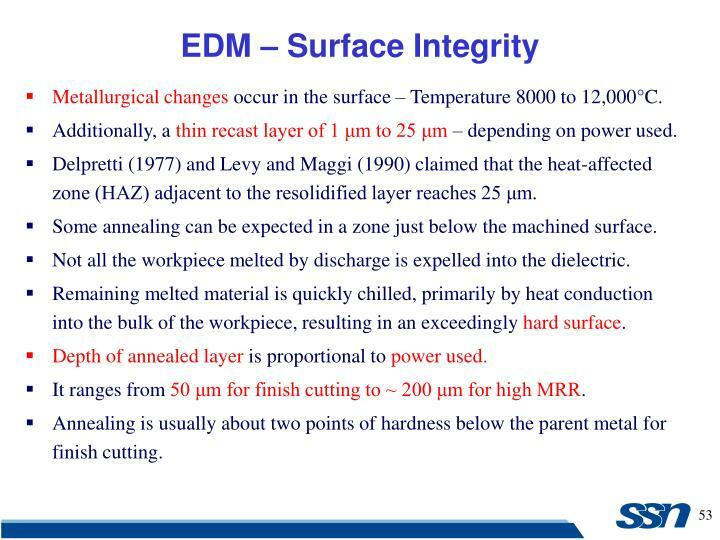 Rapid heating and cooling leads to surface hardening which may be desirable in some applications. 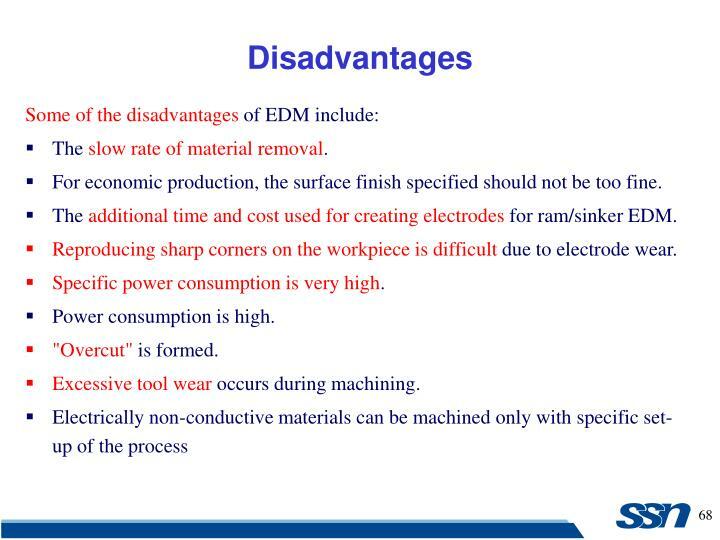 Tolerance value of + 0.05 mm could be easily achieved by EDM. Best surface finish that can be economically achieved on steel is 0.40 m. Drilling of micro-holes, thread cutting, helical profile milling, rotary forming, and curved hole drilling. Delicate work piece like copper parts can be produced by EDM. Can be applied to all electrically conducting metals and alloys irrespective of their melting points, hardness, toughness, or brittleness. 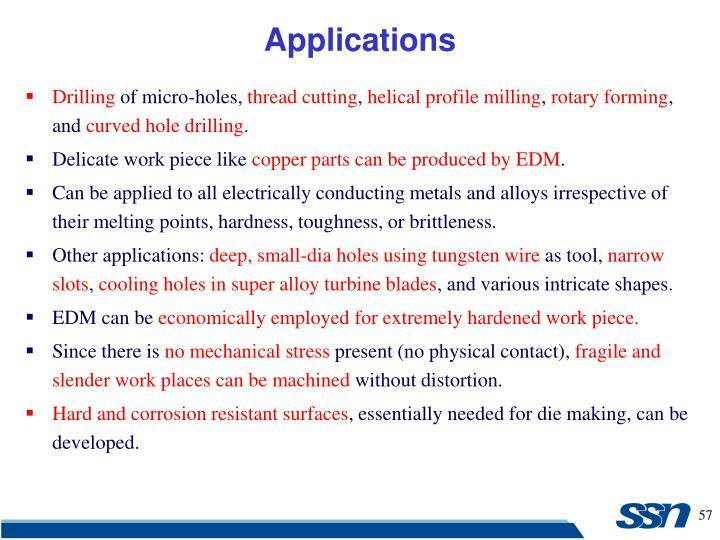 Other applications: deep, small-dia holes using tungsten wire as tool, narrow slots, cooling holes in super alloy turbine blades, and various intricate shapes. 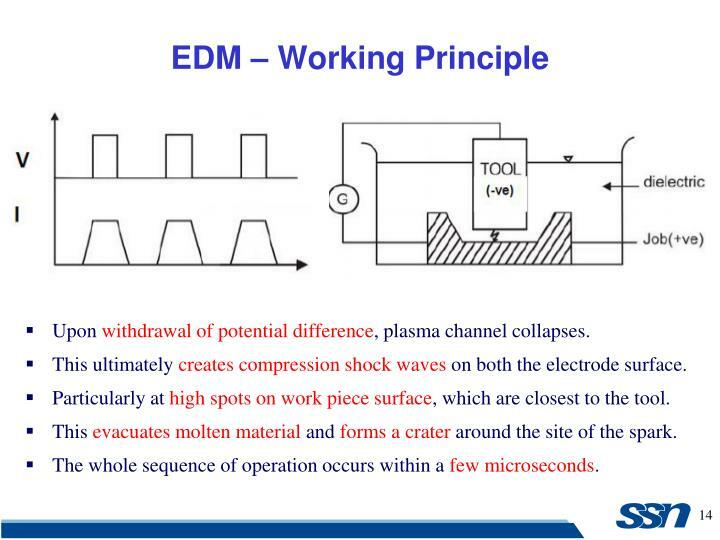 EDM can be economically employed for extremely hardened work piece. Since there is no mechanical stress present (no physical contact), fragile and slender work places can be machined without distortion. 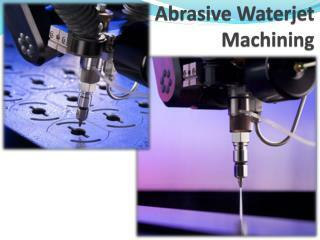 Hard and corrosion resistant surfaces, essentially needed for die making, can be developed. 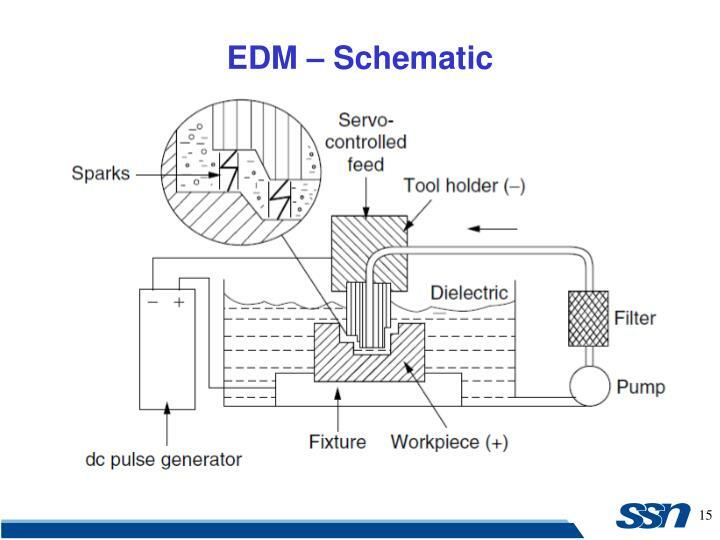 Uses a tubular tool electrode where the dielectric is flushed. When solid rods are used; dielectric is fed to the machining zone by either suction or injection through pre-drilled holes. Irregular, tapered, curved, as well as inclined holes can be produced by EDM. 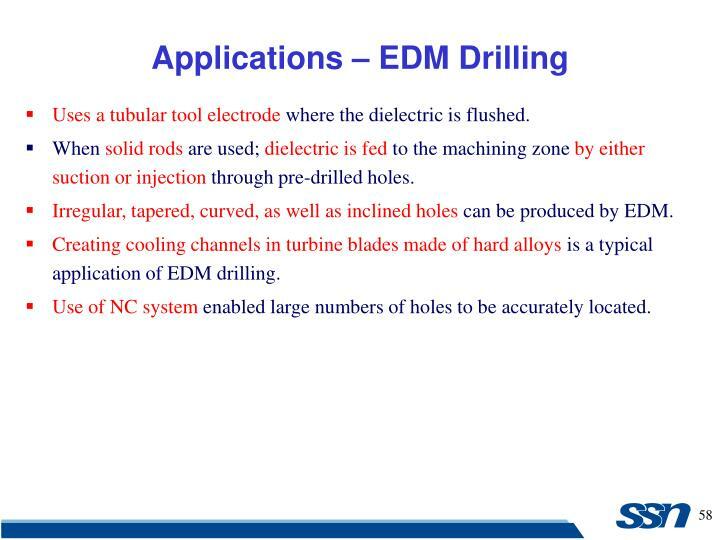 Creating cooling channels in turbine blades made of hard alloys is a typical application of EDM drilling. Use of NC system enabled large numbers of holes to be accurately located. An EDM variation - Employs either a special steel band or disc. Cuts at a rate that is twice that of the conventional abrasive sawing method. 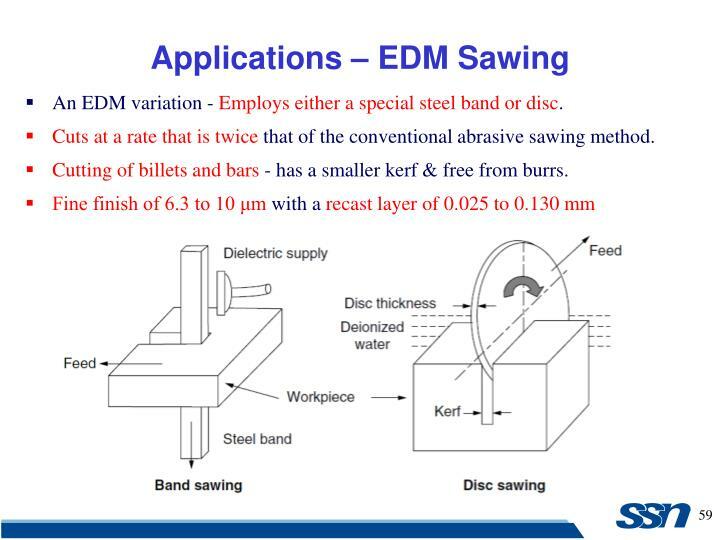 Cutting of billets and bars - has a smaller kerf & free from burrs. 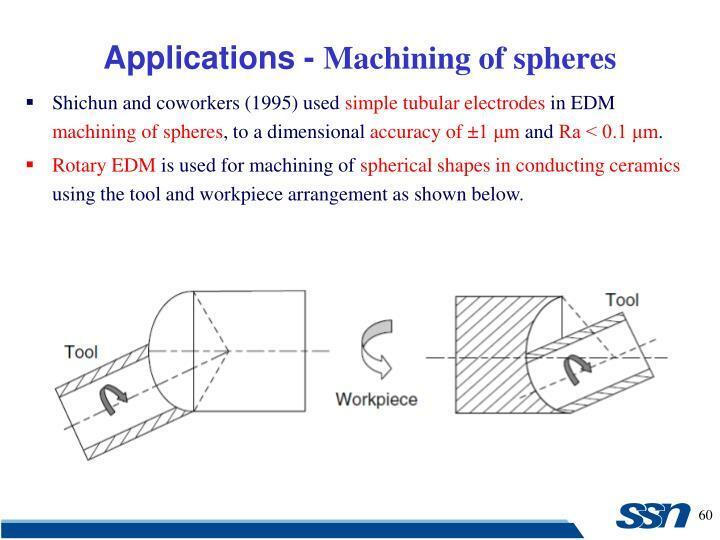 Shichun and coworkers (1995) used simple tubular electrodes in EDM machining of spheres, to a dimensional accuracy of ±1 μm and Ra < 0.1 μm. Rotary EDM is used for machining of spherical shapes in conducting ceramics using the tool and workpiece arrangement as shown below. 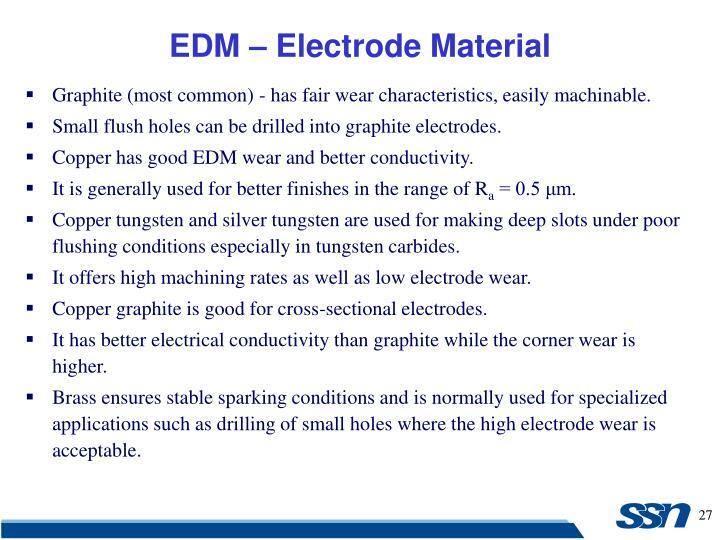 EDM milling uses standard cylindrical electrodes. Simple-shaped electrode (Fig. 1) is rotated at high speeds and follows specified paths in the workpiece like the conventional end mills. 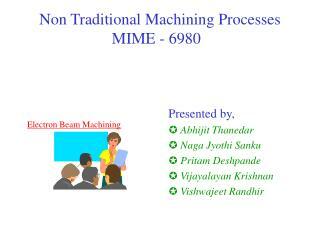 Very useful and makes EDM very versatile like mechanical milling process. 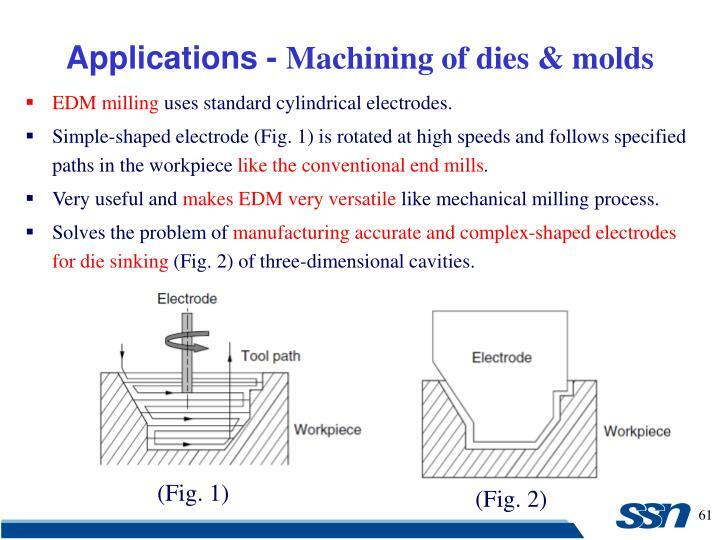 Solves the problem of manufacturing accurate and complex-shaped electrodes for die sinking (Fig. 2) of three-dimensional cavities. 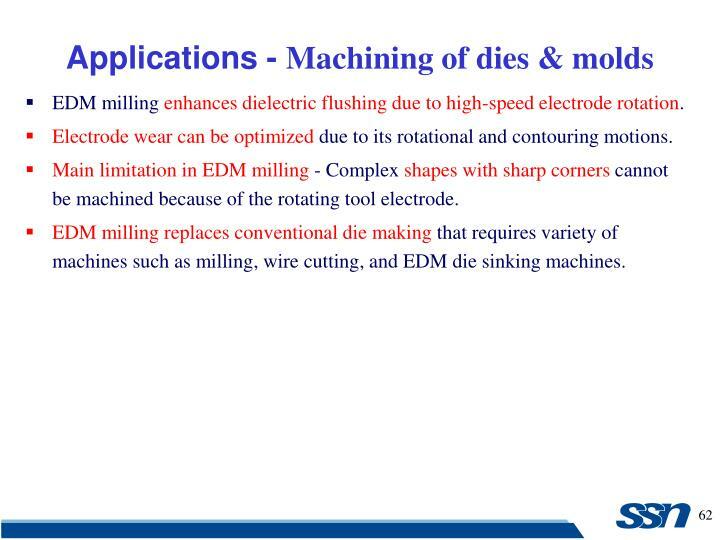 EDM milling enhances dielectric flushing due to high-speed electrode rotation. 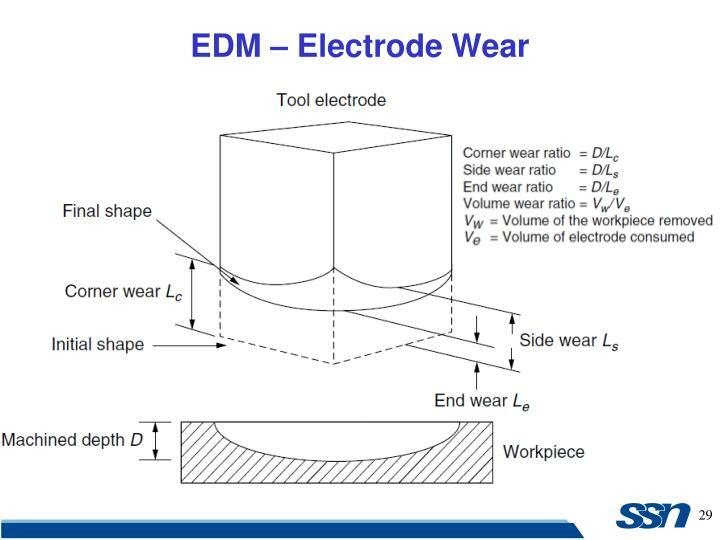 Electrode wear can be optimized due to its rotational and contouring motions. Main limitation in EDM milling - Complex shapes with sharp corners cannot be machined because of the rotating tool electrode. EDM milling replaces conventional die making that requires variety of machines such as milling, wire cutting, and EDM die sinking machines. 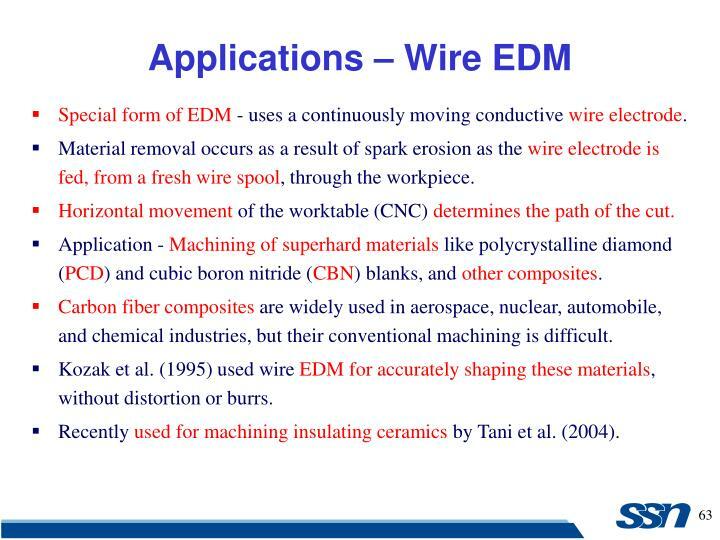 Special form of EDM - uses a continuously moving conductive wire electrode. Material removal occurs as a result of spark erosion as the wire electrode is fed, from a fresh wire spool, through the workpiece. Horizontal movement of the worktable (CNC) determines the path of the cut. Application - Machining of superhard materials like polycrystalline diamond (PCD) and cubic boron nitride (CBN) blanks, and other composites. Carbon fiber composites are widely used in aerospace, nuclear, automobile, and chemical industries, but their conventional machining is difficult. Kozak et al. (1995) used wire EDM for accurately shaping these materials, without distortion or burrs. Recently used for machining insulating ceramics by Tani et al. (2004). A sheet metal mesh is placed over the ceramic material. 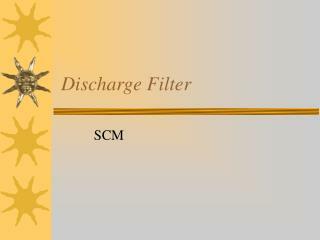 Spark discharges between the negative tool electrode and the metal mesh. 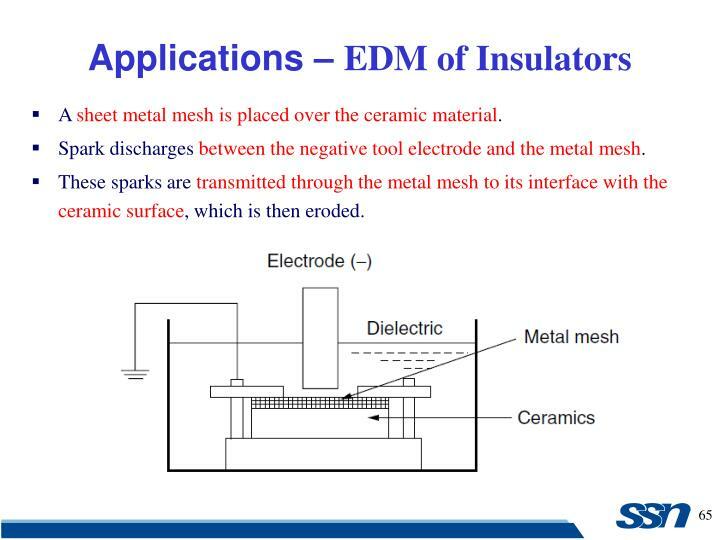 These sparks are transmitted through the metal mesh to its interface with the ceramic surface, which is then eroded. Texturing is applied to steel sheets during the final stages of cold rolling. Shot blasting (SB) is an inexpensive method of texturing. Limitations of SB include its lack of control and consistency of texturing, and the need for protection of other parts of the equipment holding the roll. EDT, is a variation of EDM and proved to be the most popular. 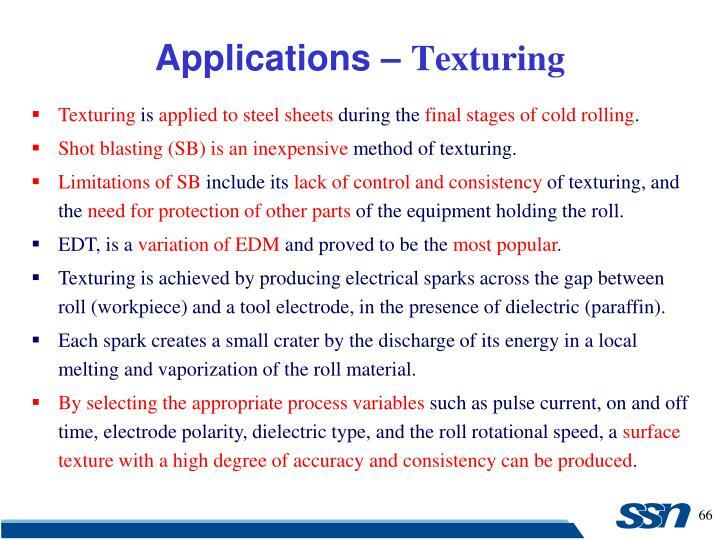 Texturing is achieved by producing electrical sparks across the gap between roll (workpiece) and a tool electrode, in the presence of dielectric (paraffin). Each spark creates a small crater by the discharge of its energy in a local melting and vaporization of the roll material. By selecting the appropriate process variables such as pulse current, on and off time, electrode polarity, dielectric type, and the roll rotational speed, a surface texture with a high degree of accuracy and consistency can be produced. For economic production, the surface finish specified should not be too fine.